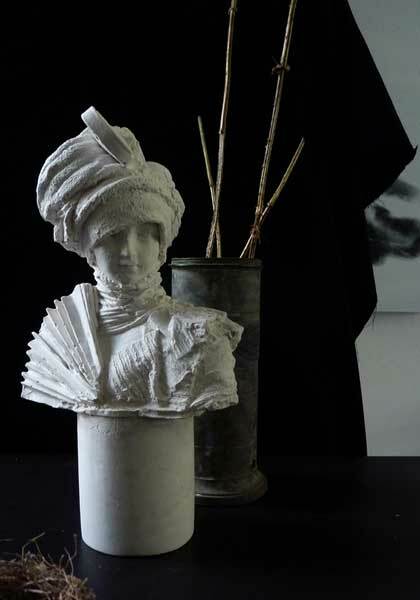 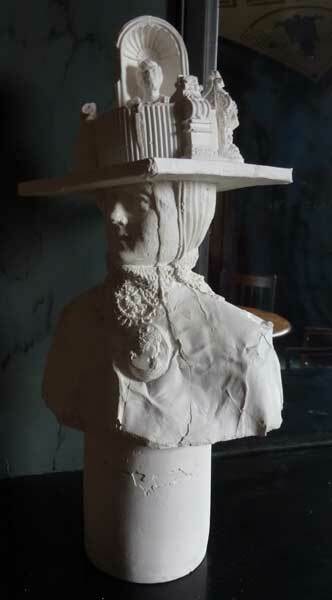 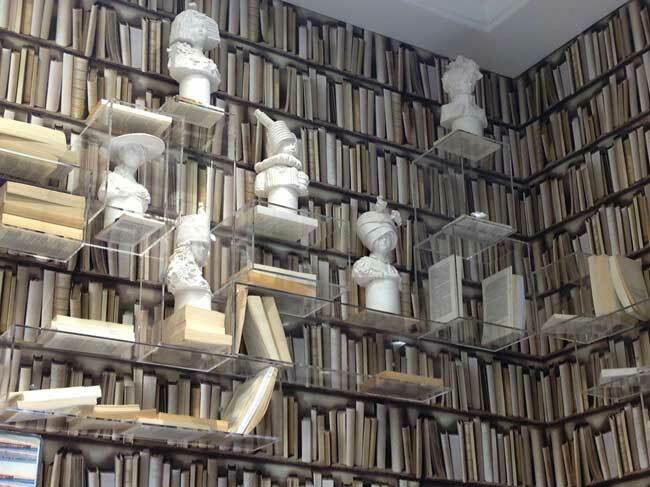 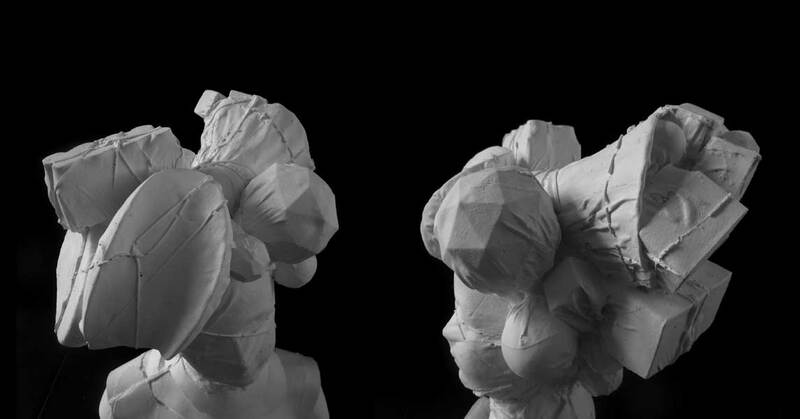 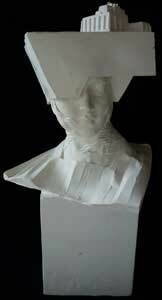 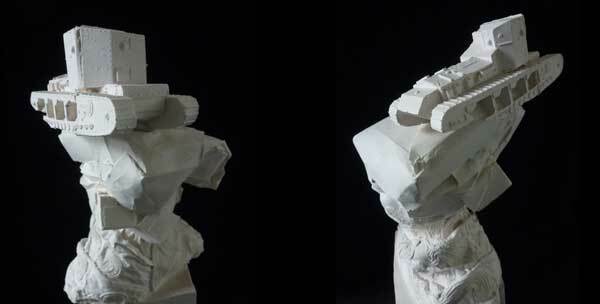 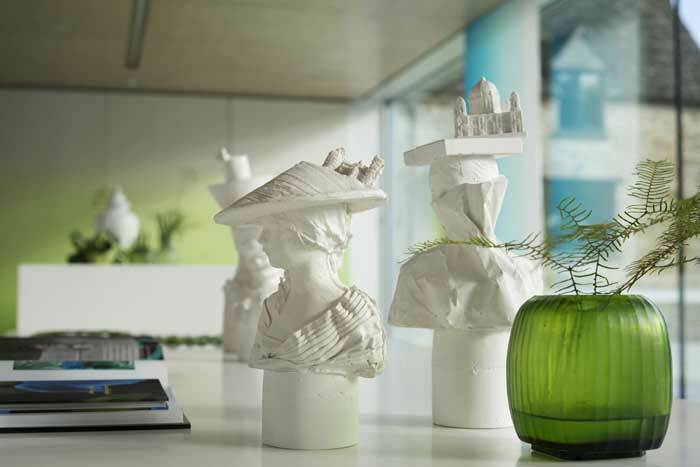 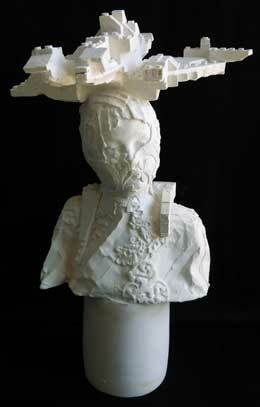 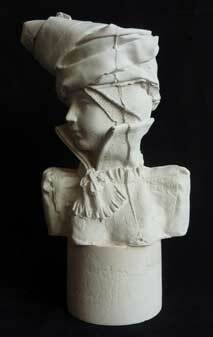 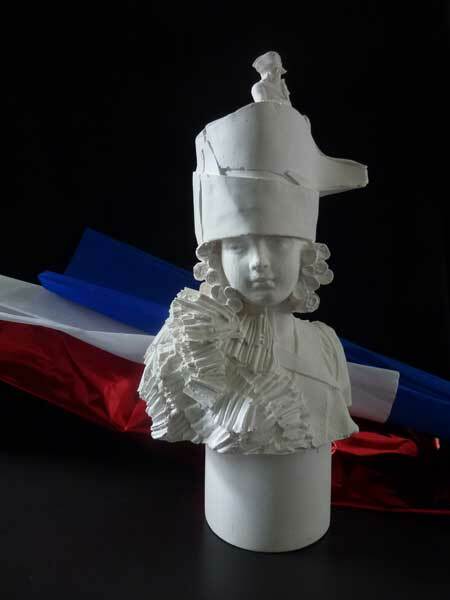 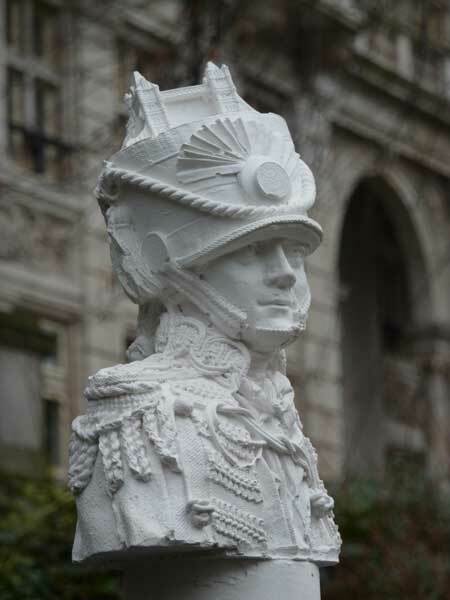 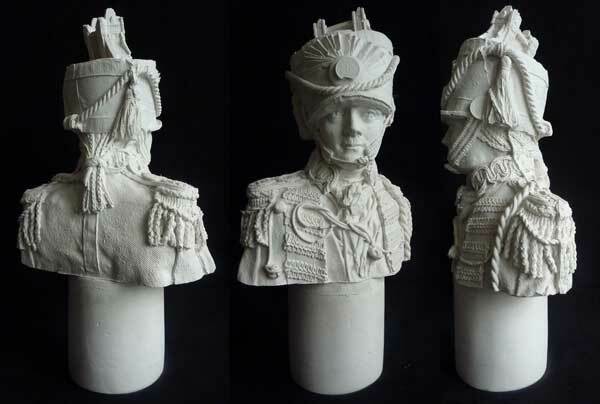 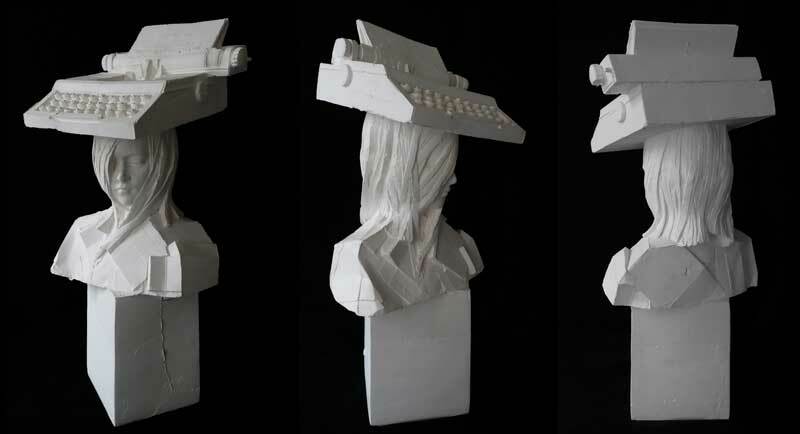 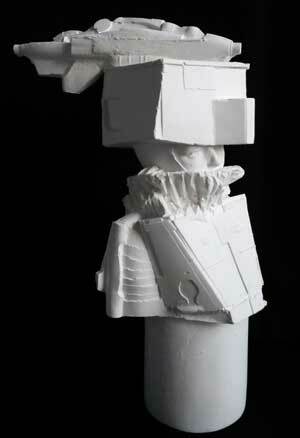 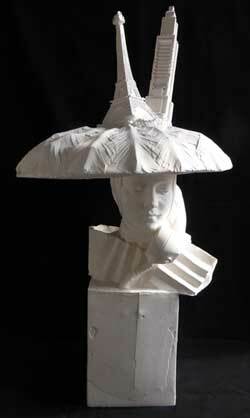 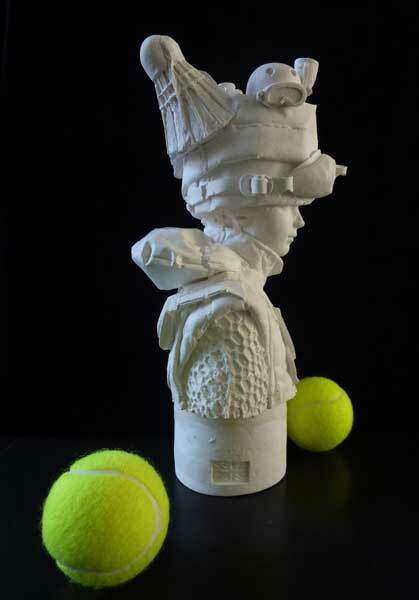 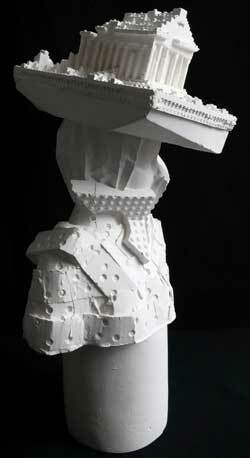 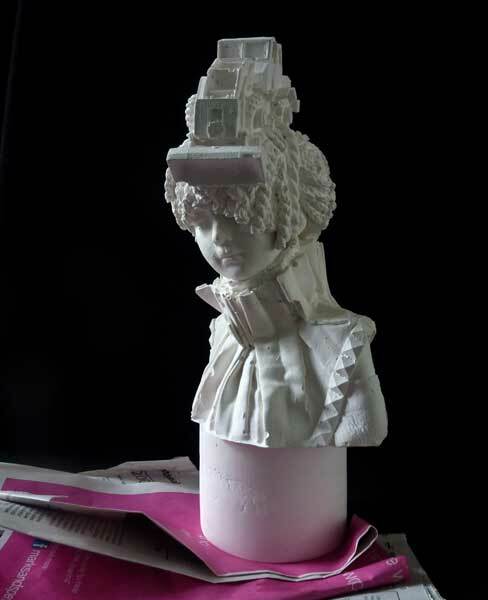 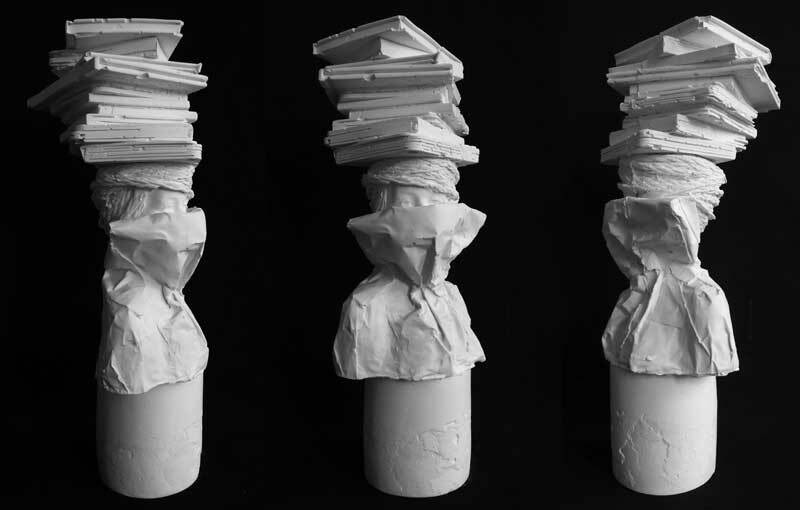 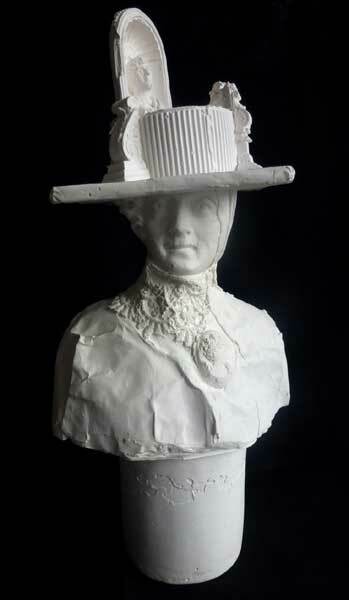 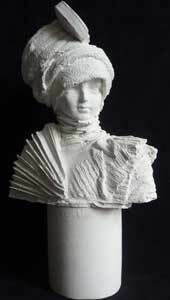 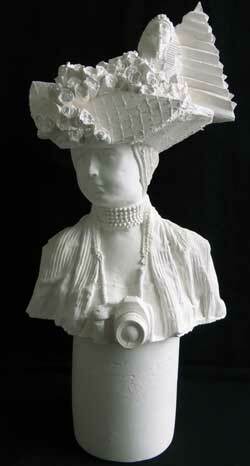 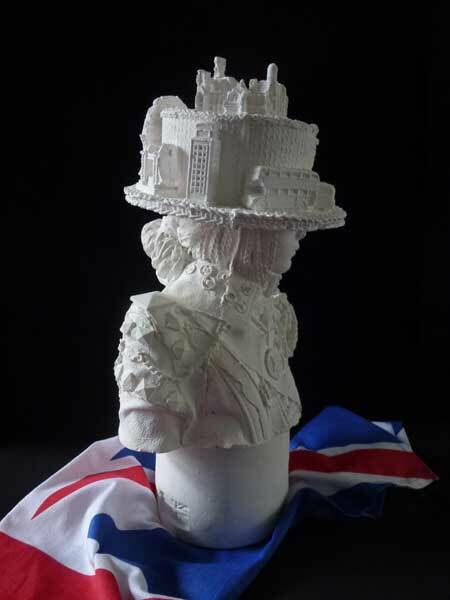 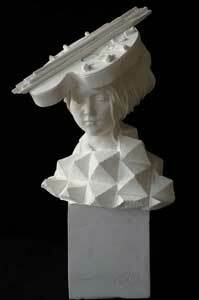 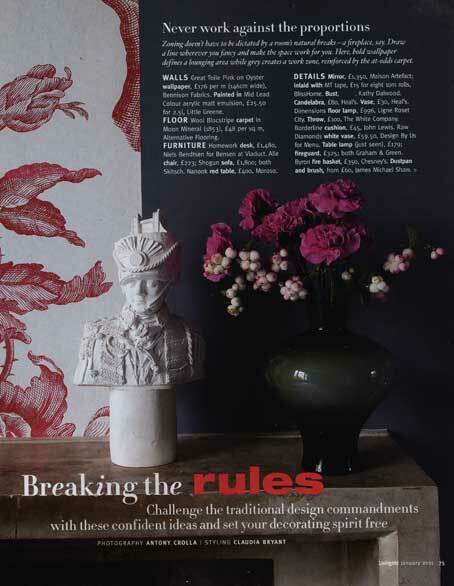 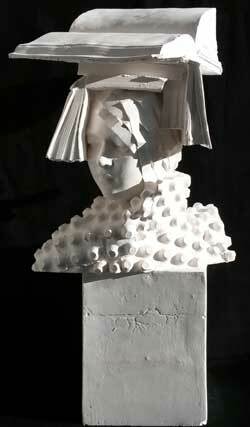 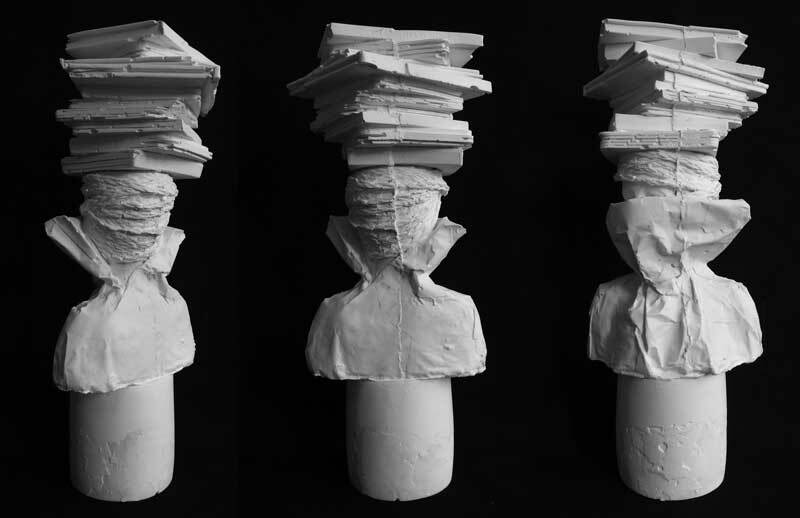 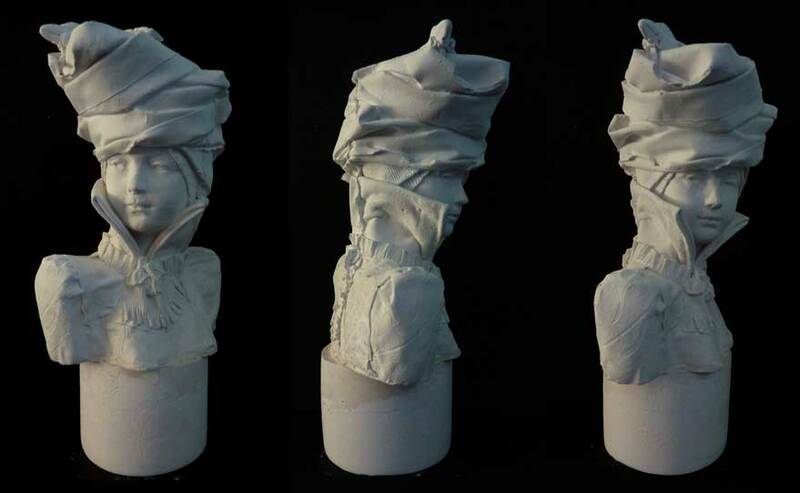 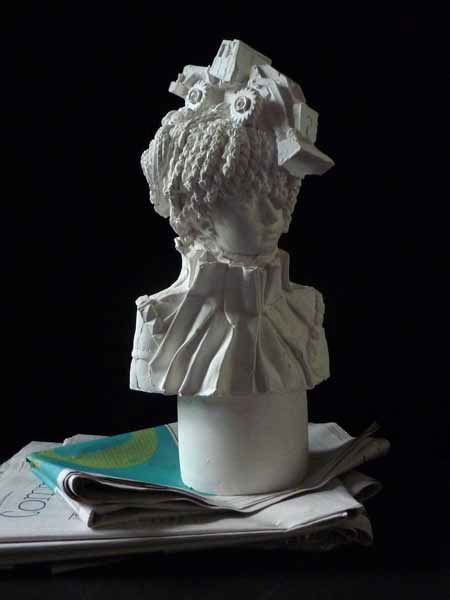 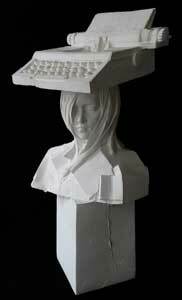 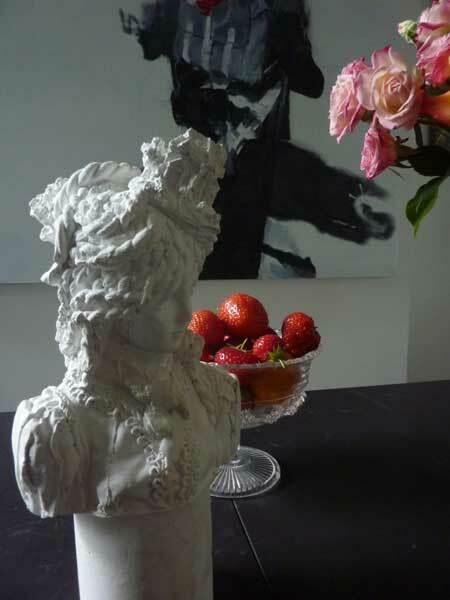 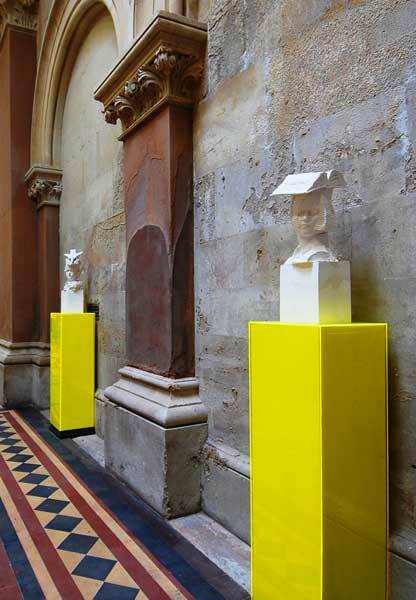 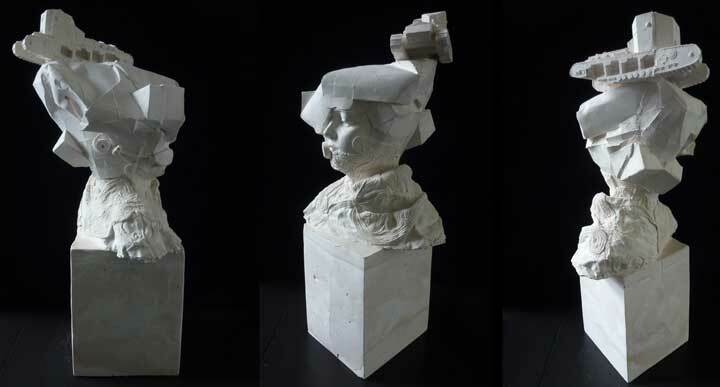 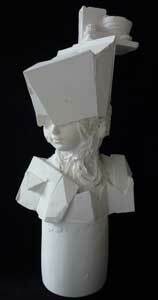 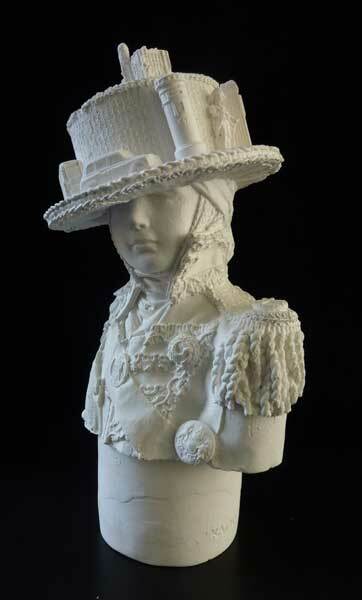 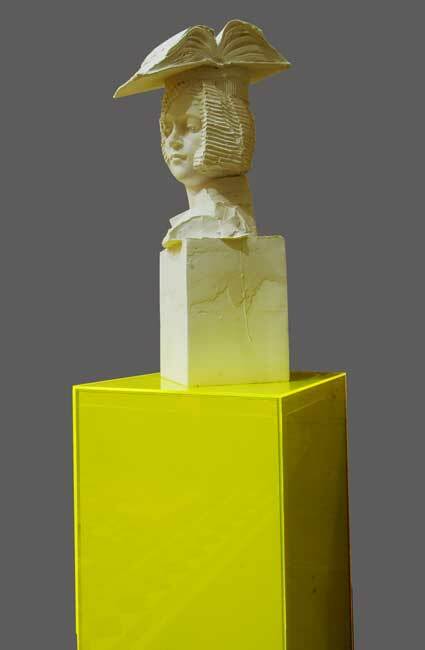 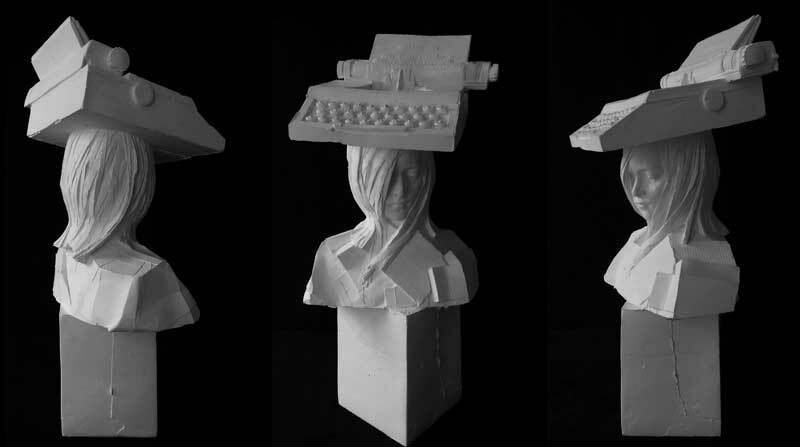 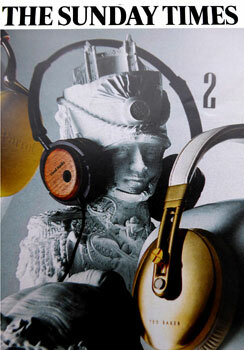 A 21st century re-interpretation of the historical portrait bust. 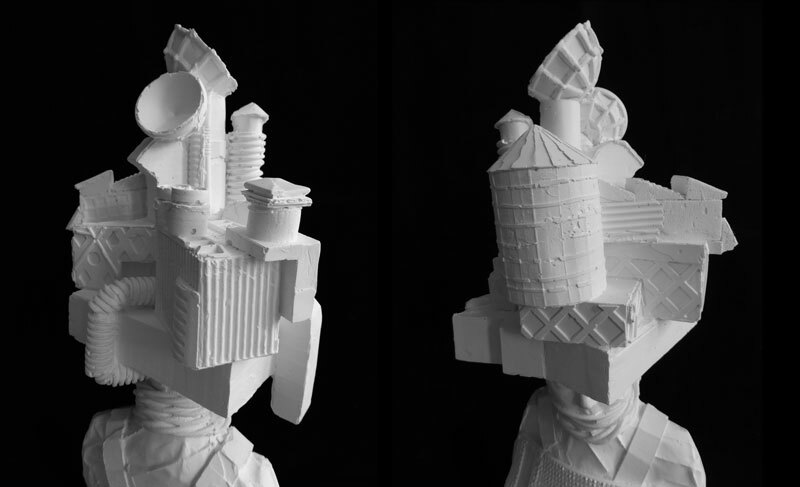 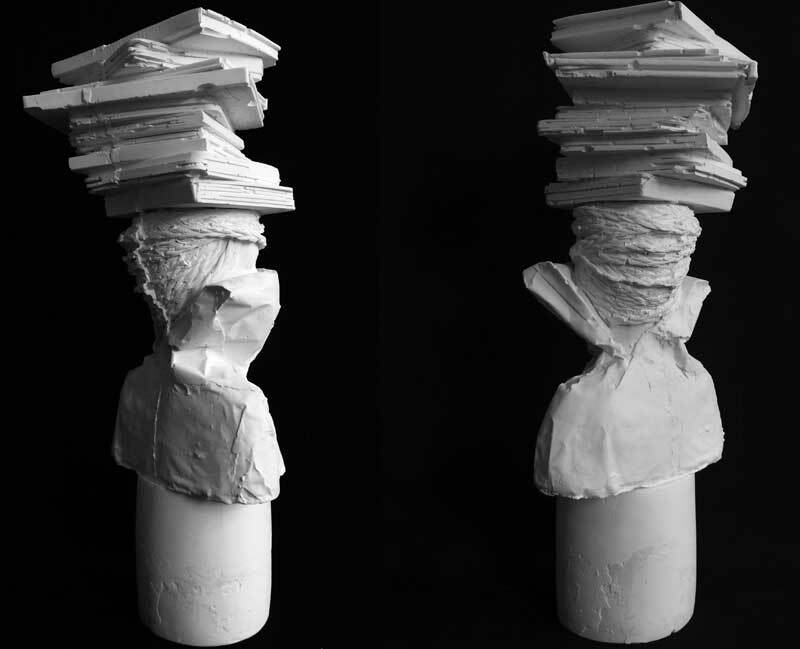 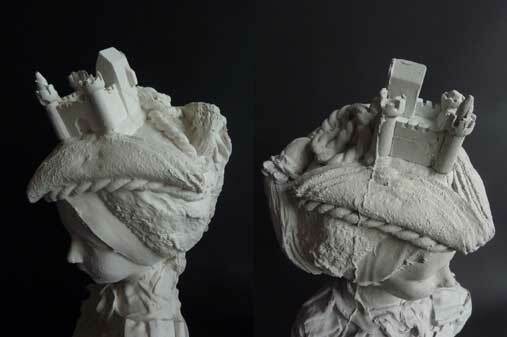 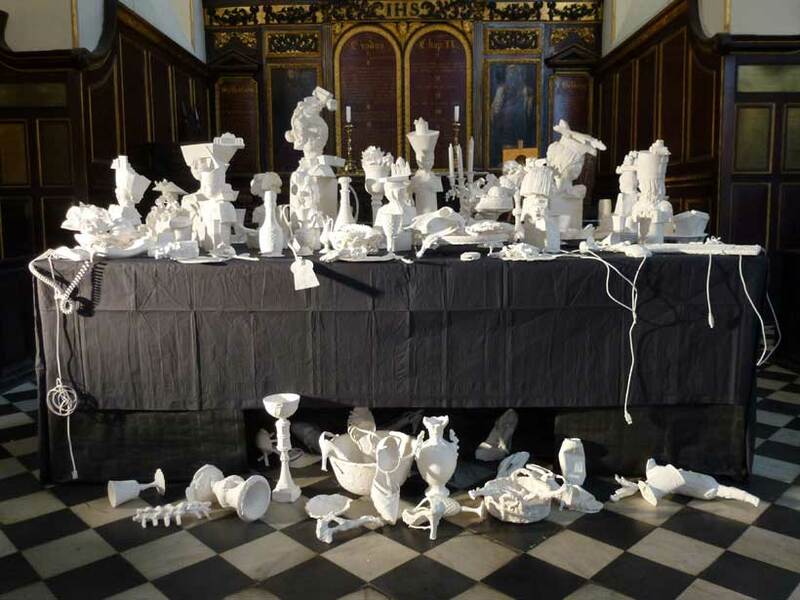 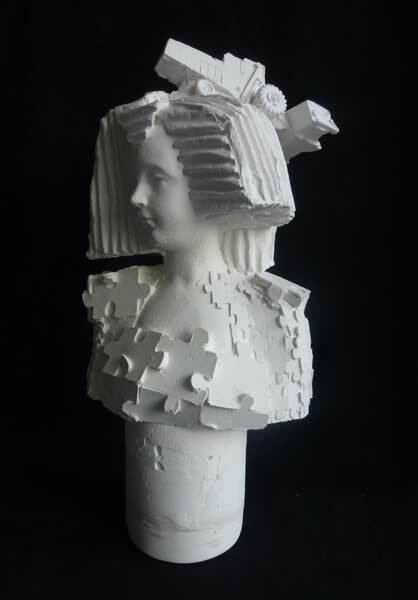 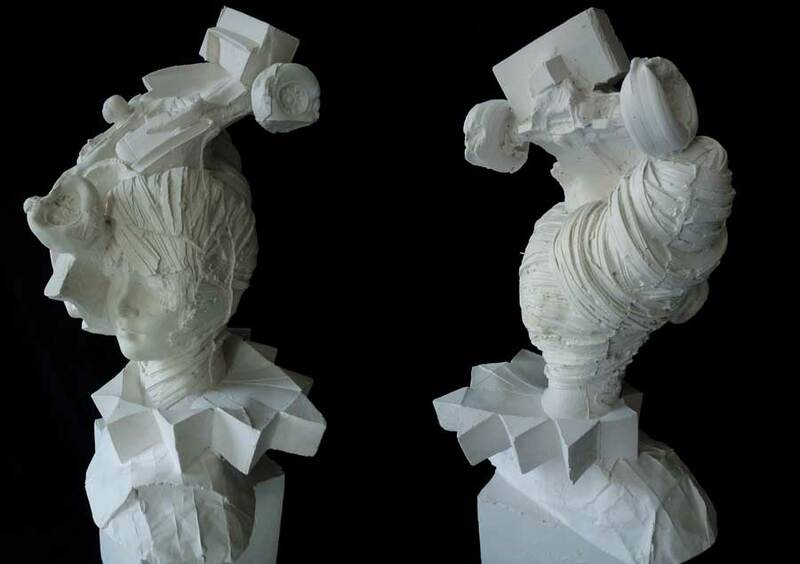 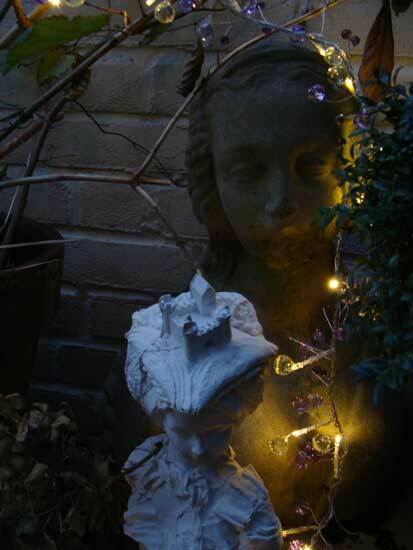 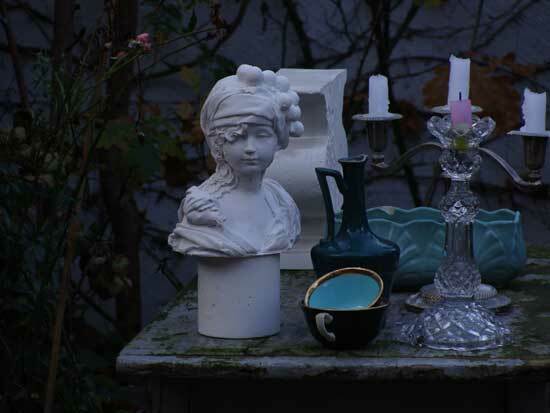 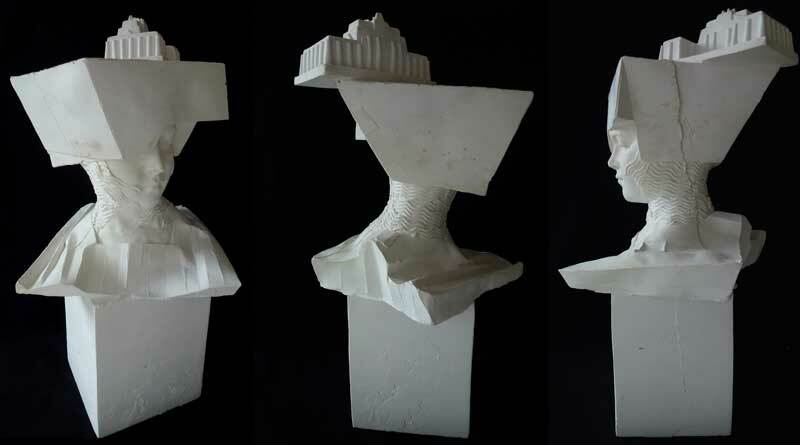 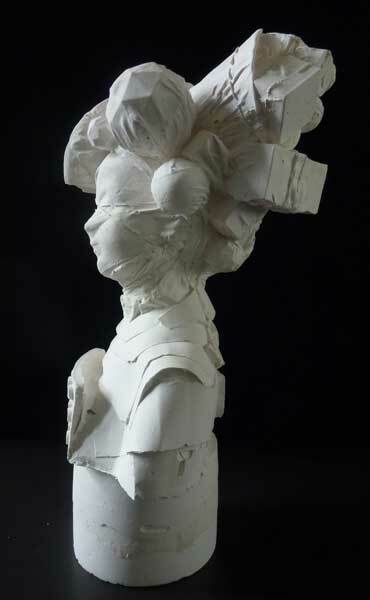 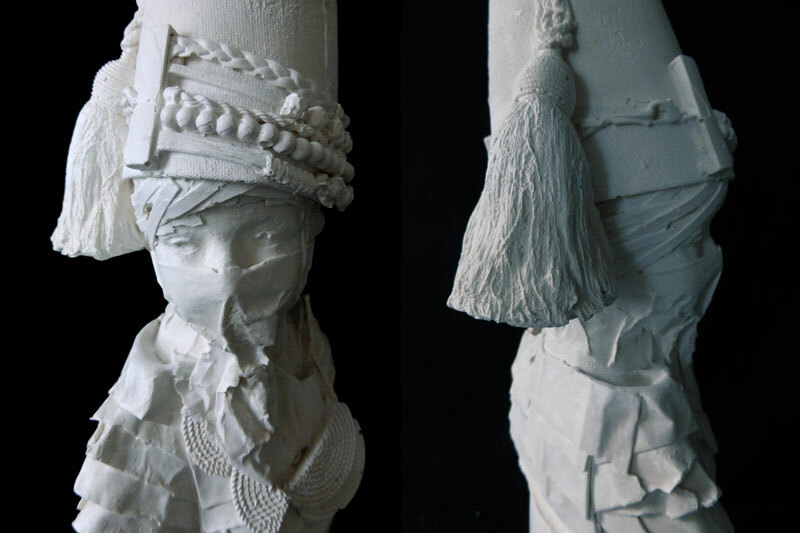 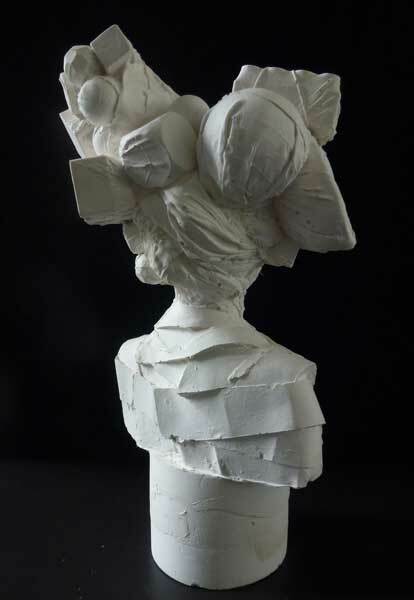 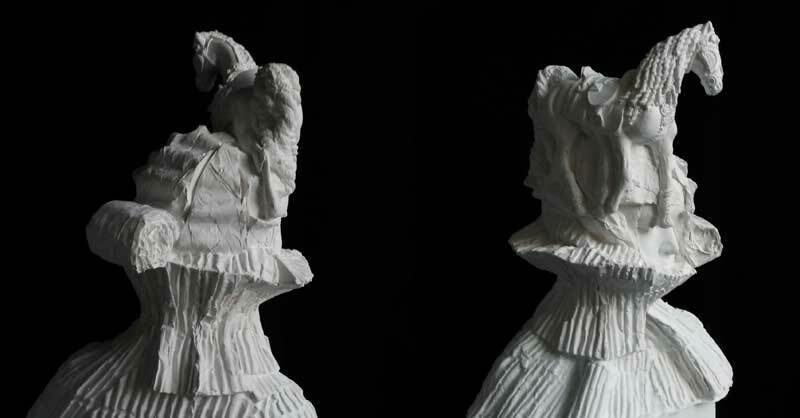 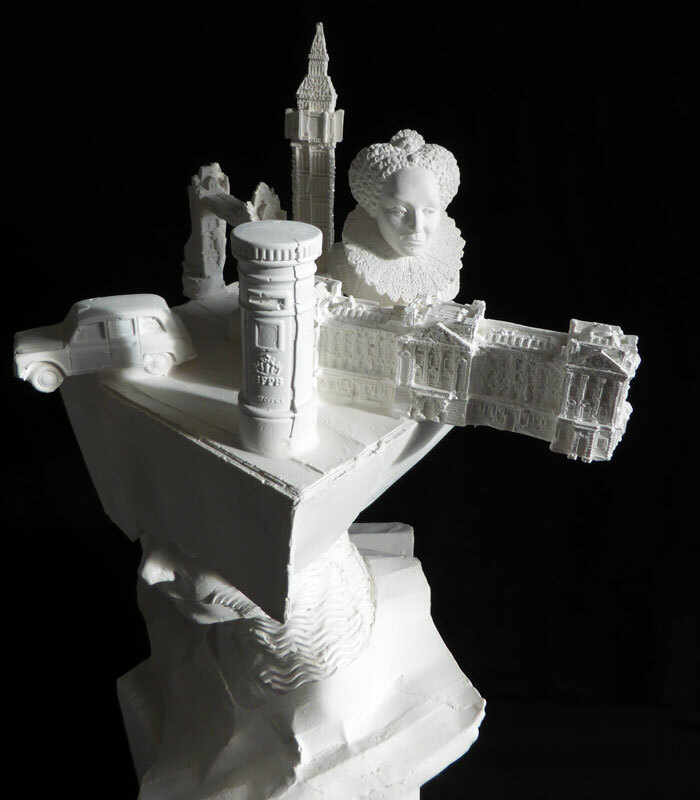 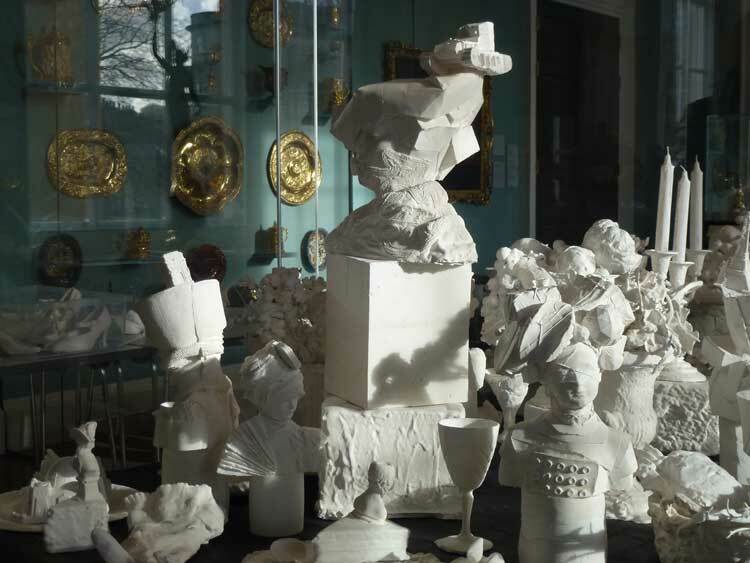 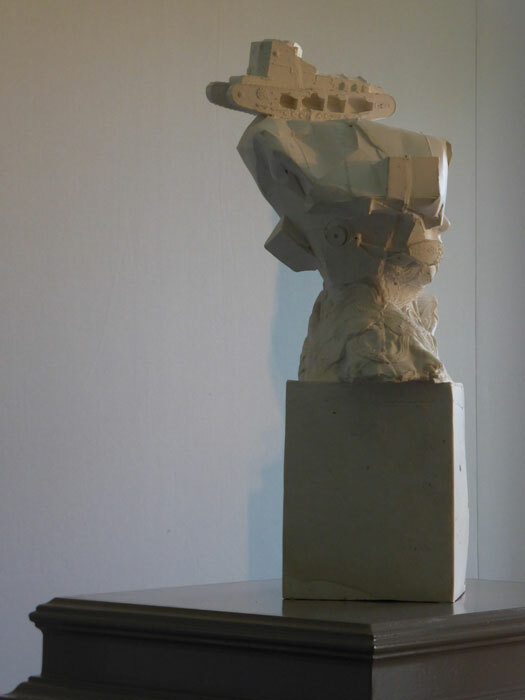 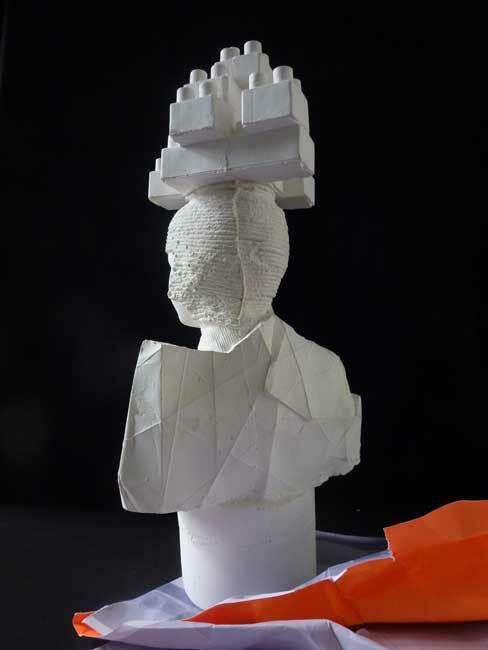 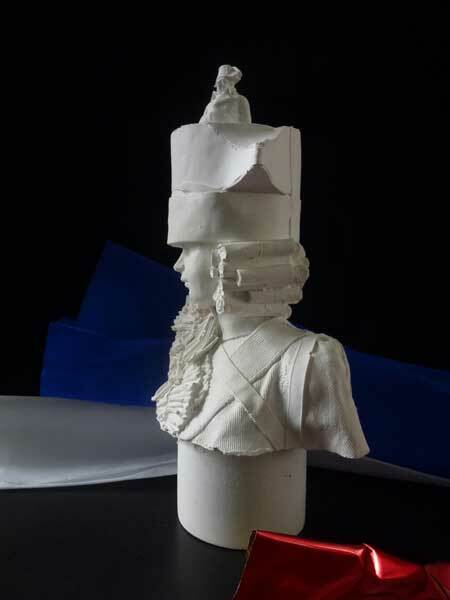 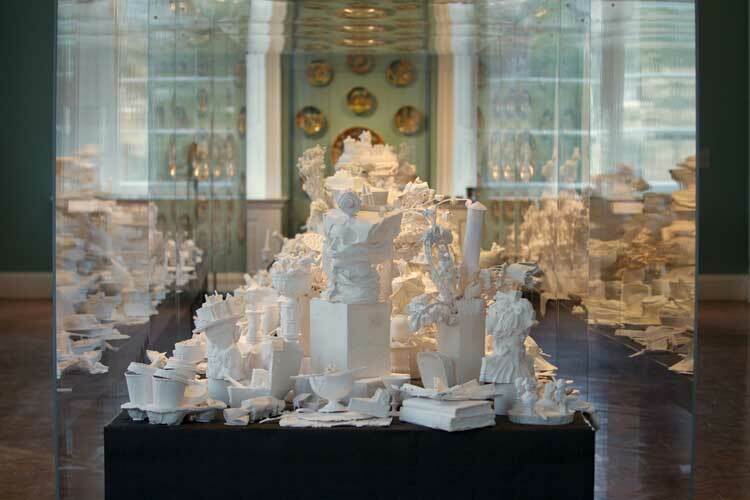 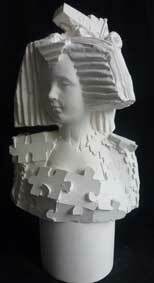 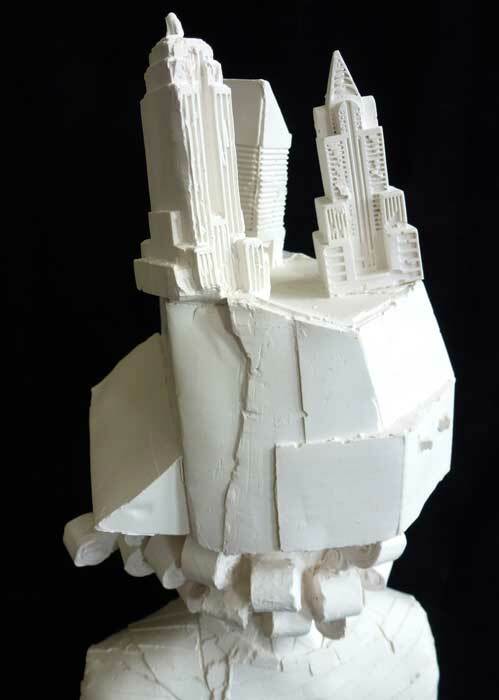 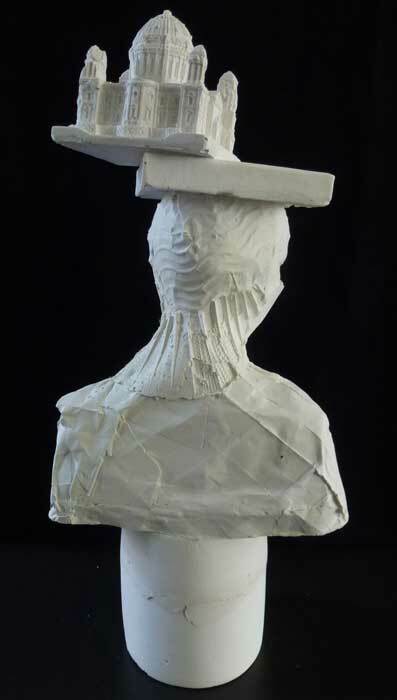 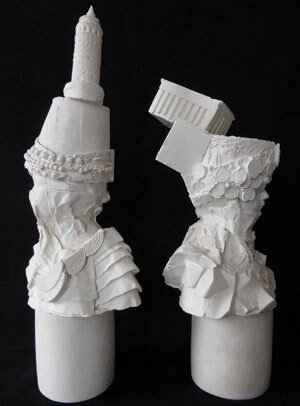 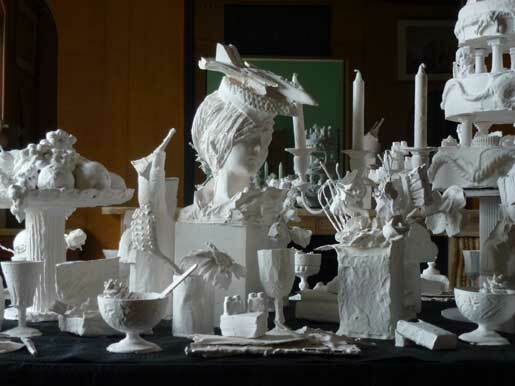 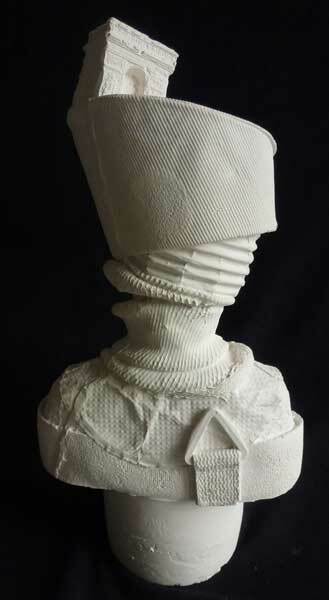 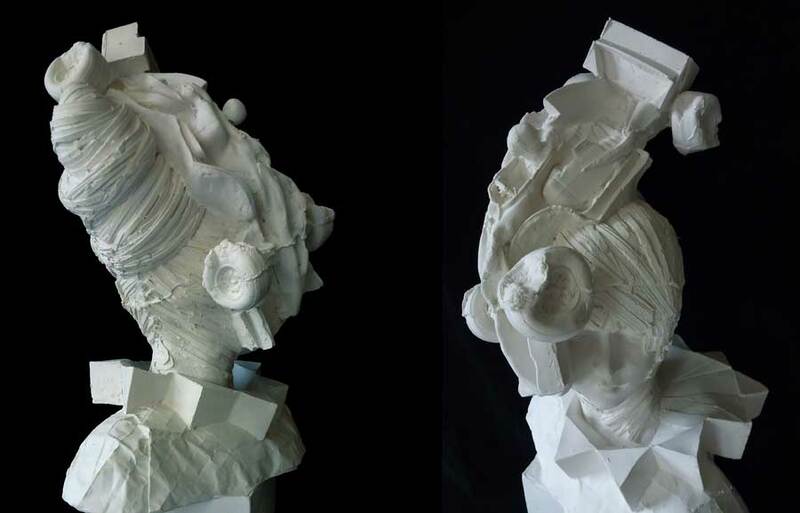 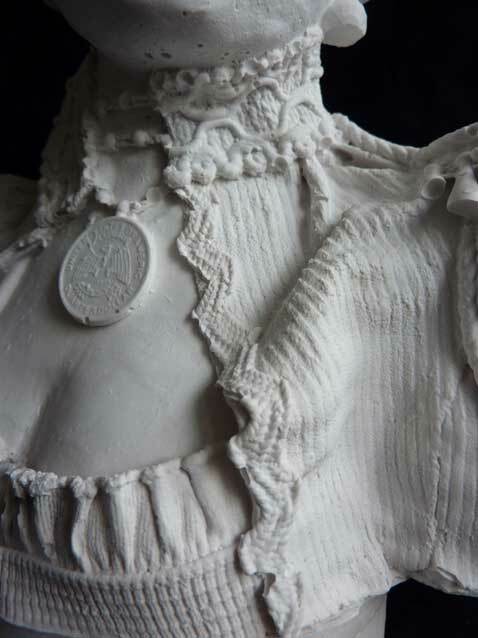 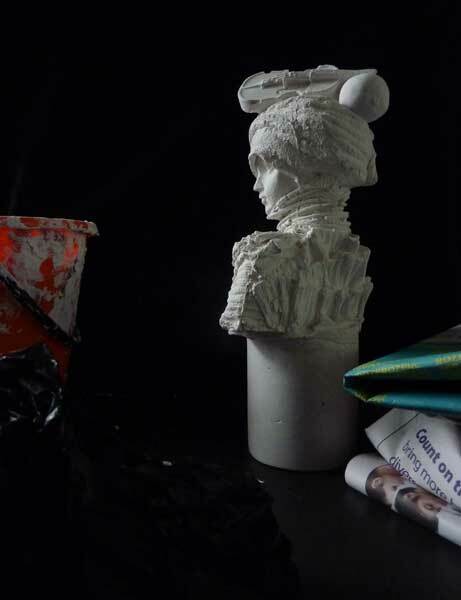 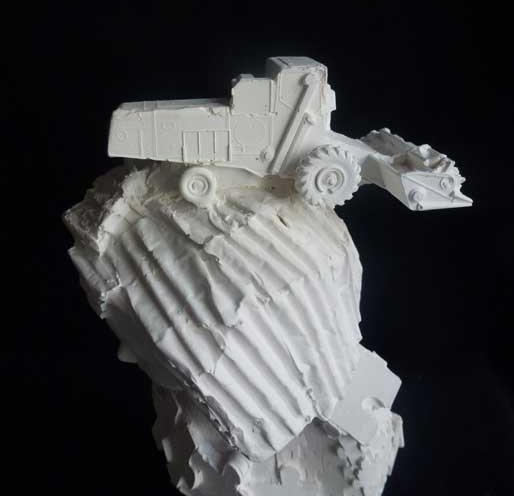 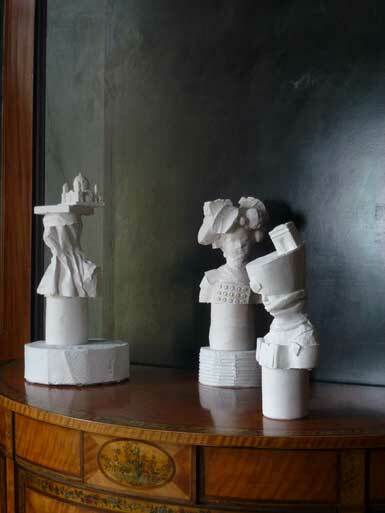 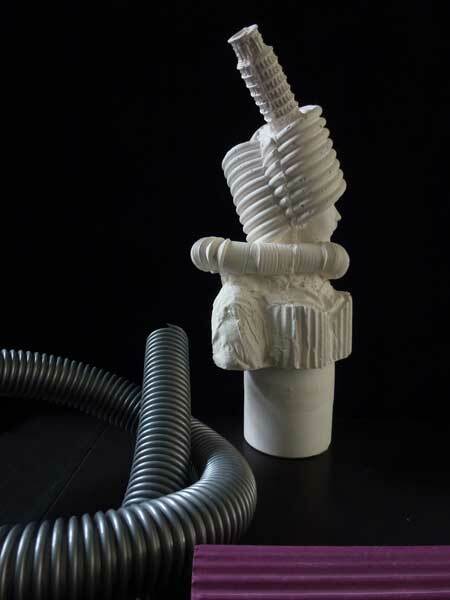 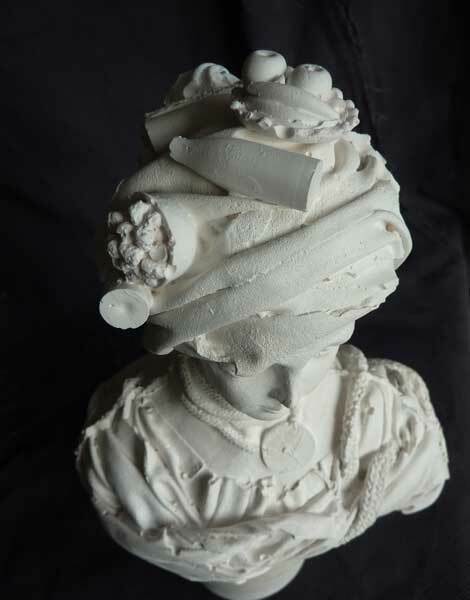 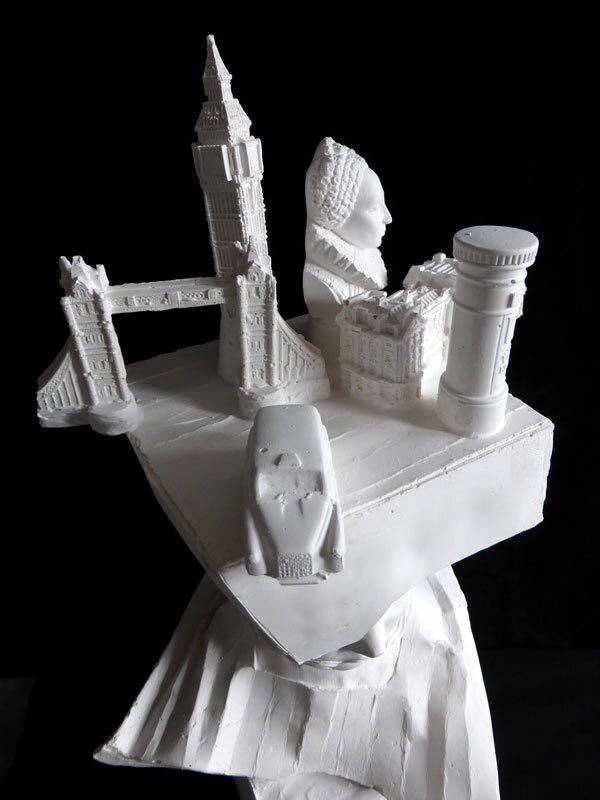 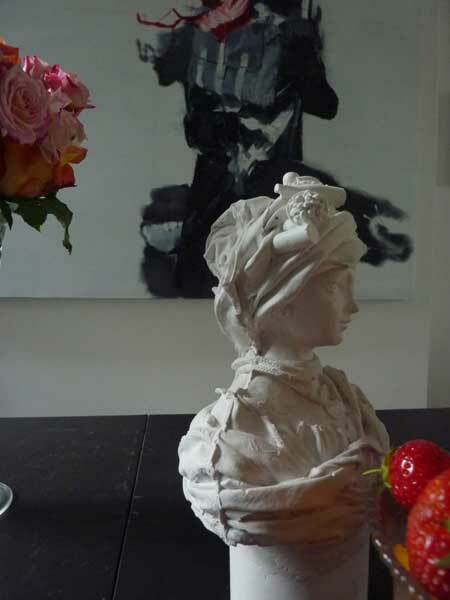 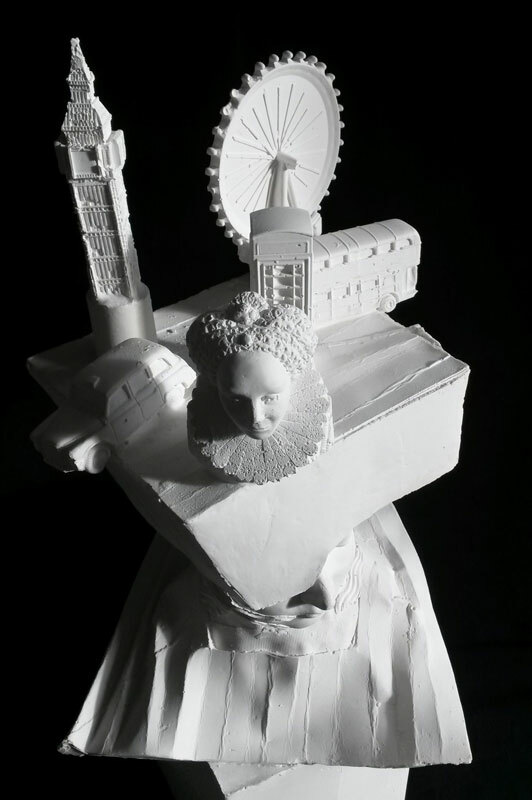 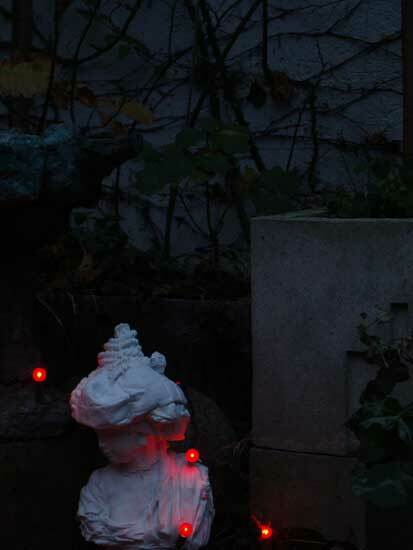 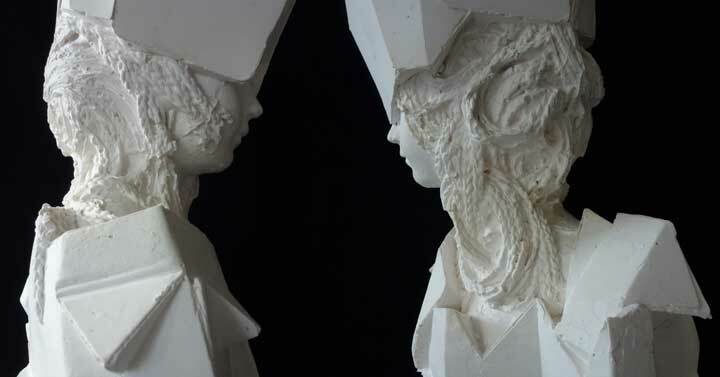 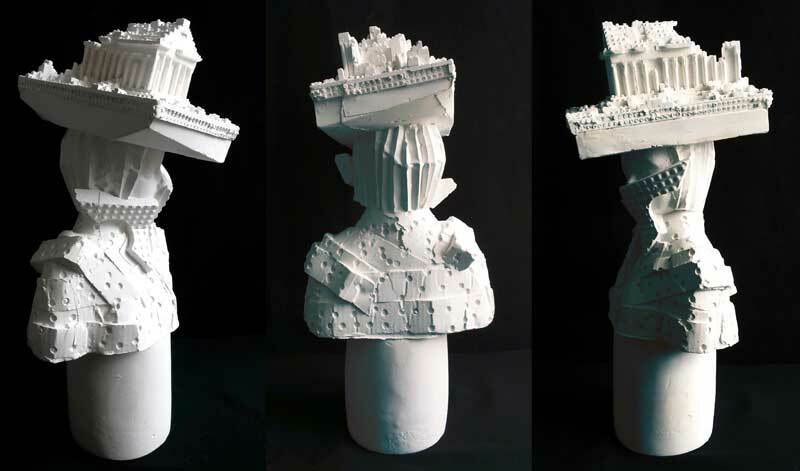 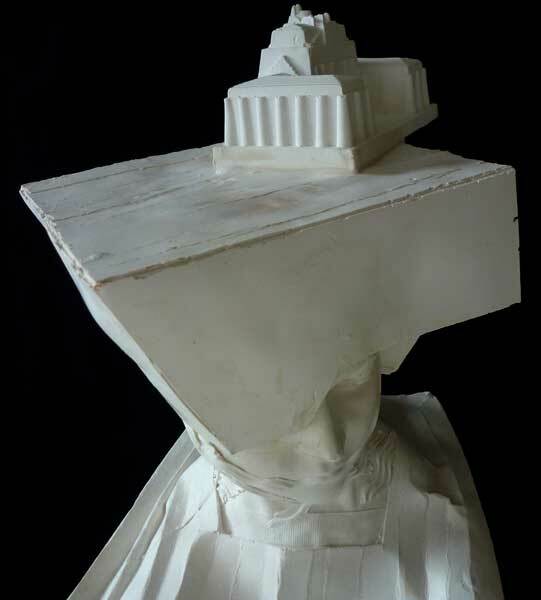 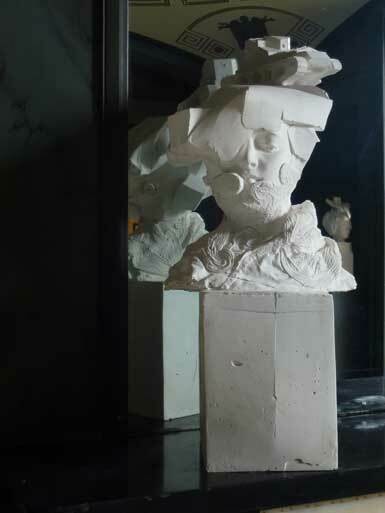 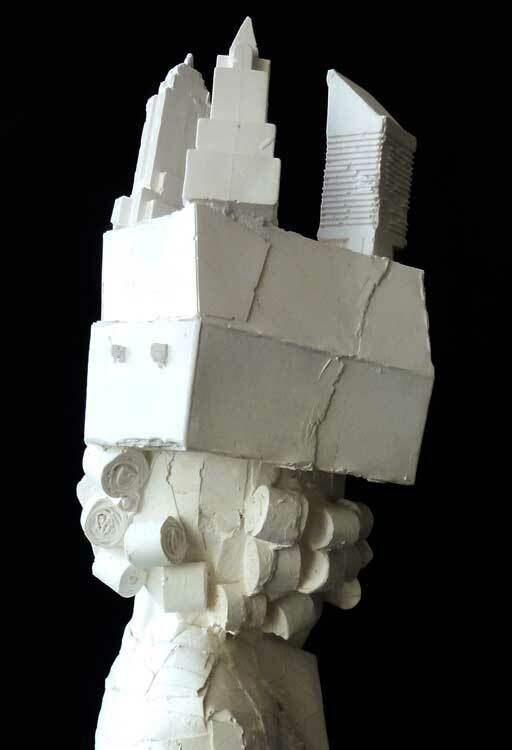 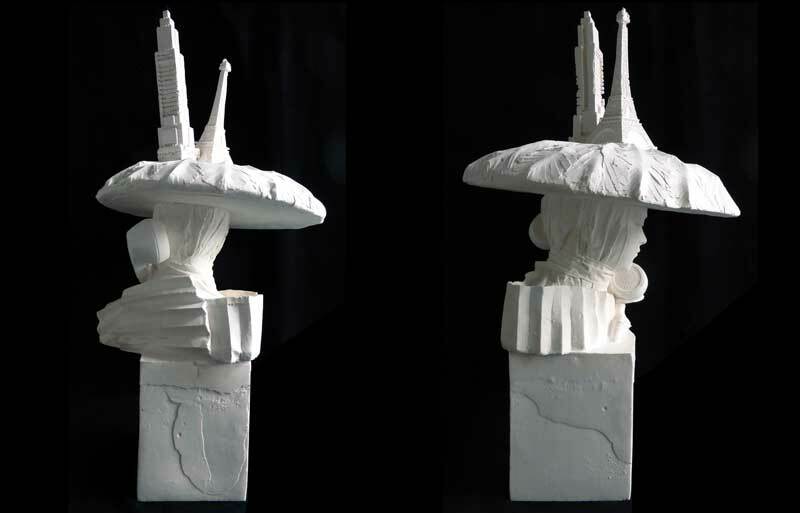 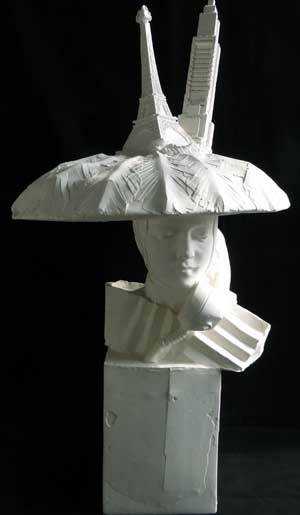 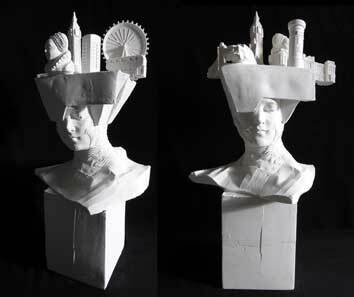 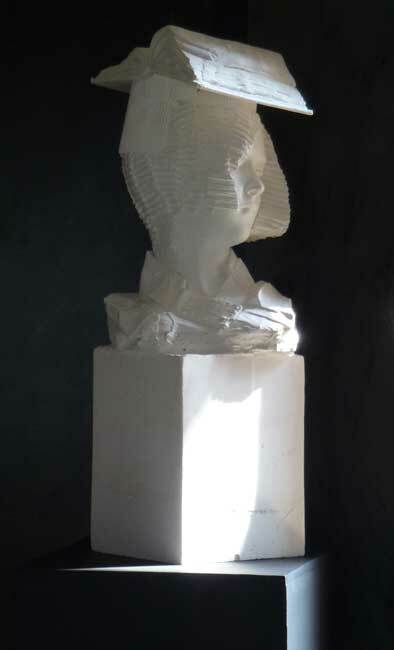 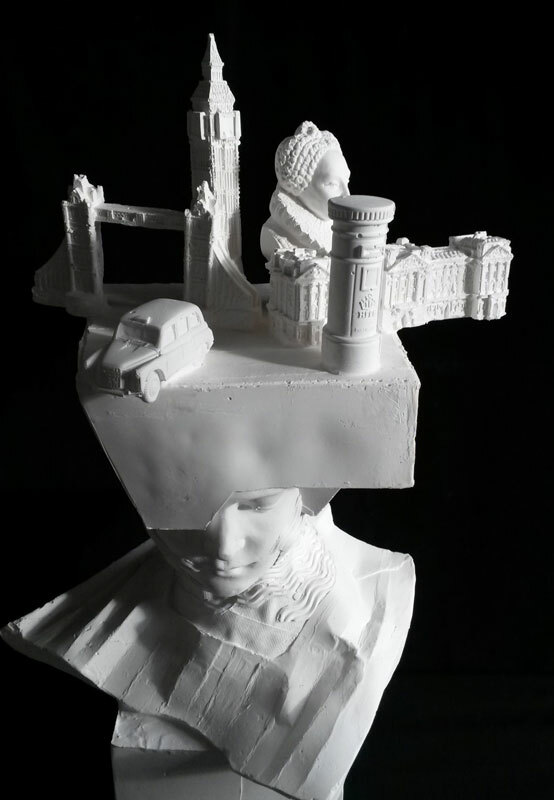 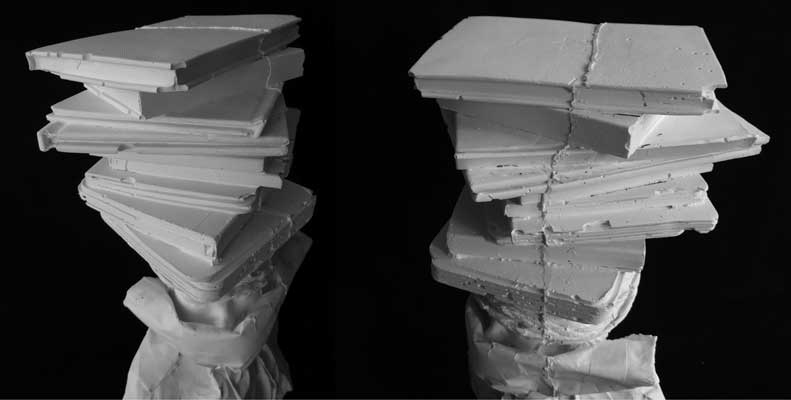 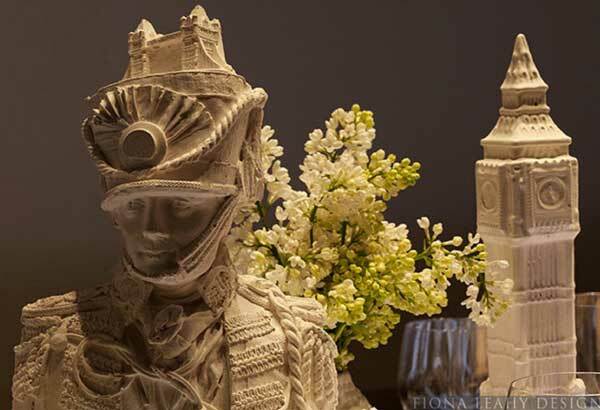 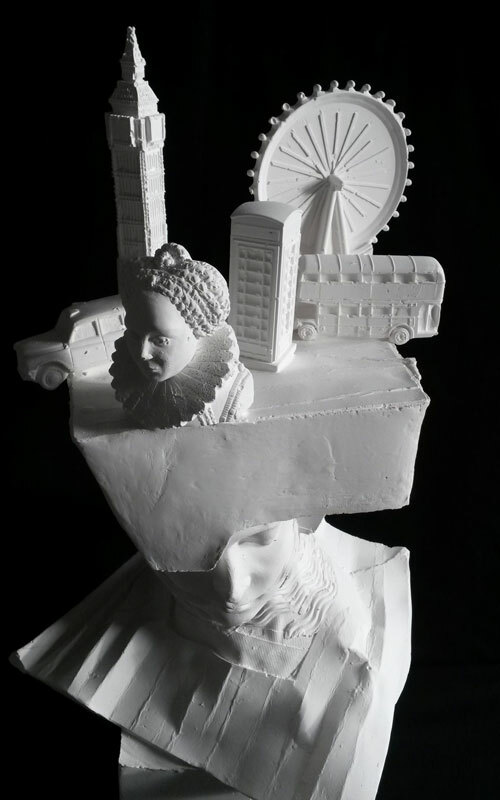 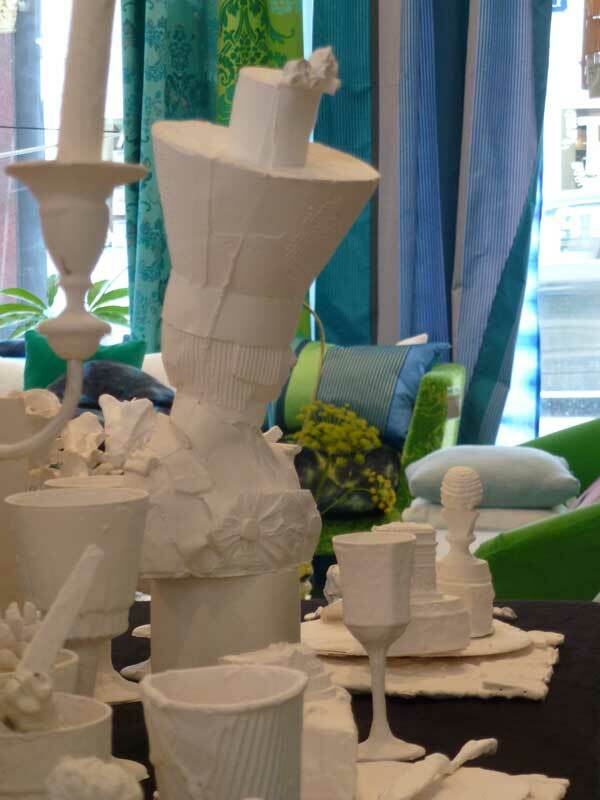 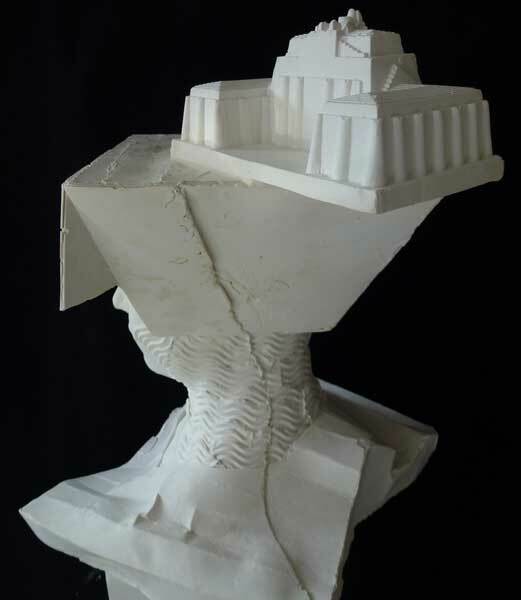 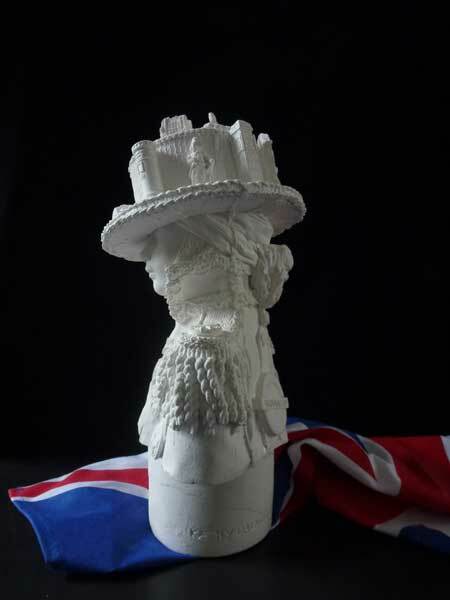 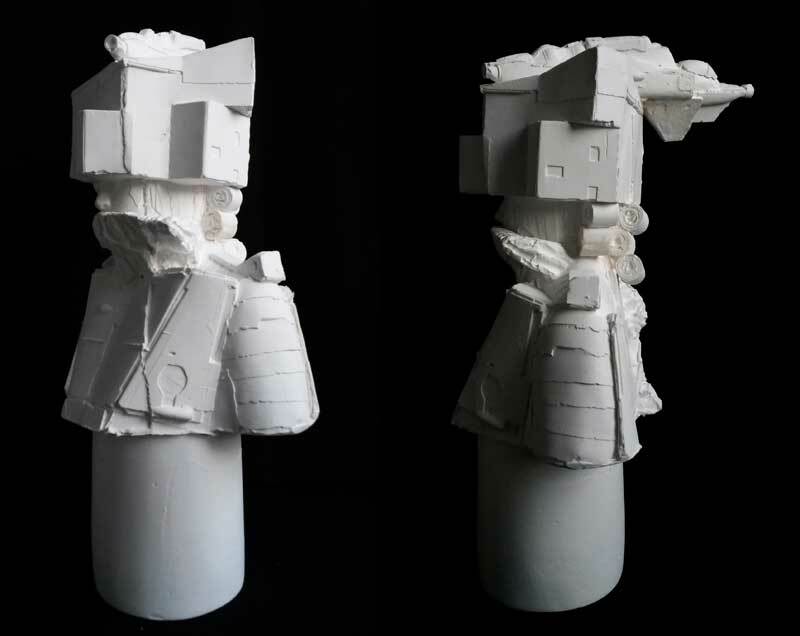 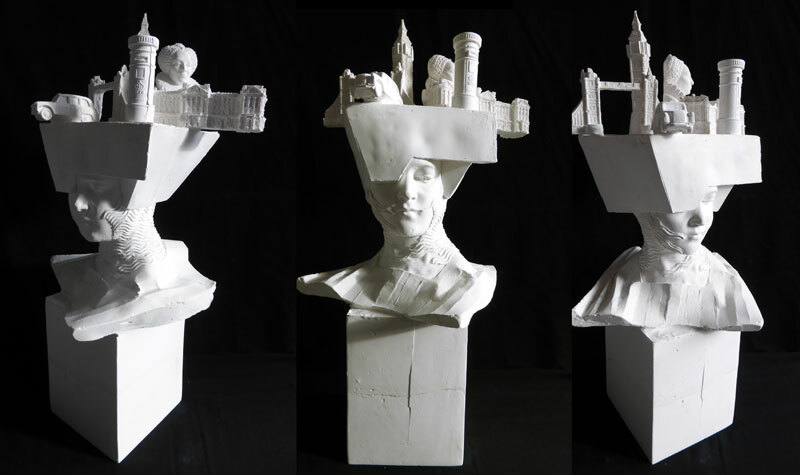 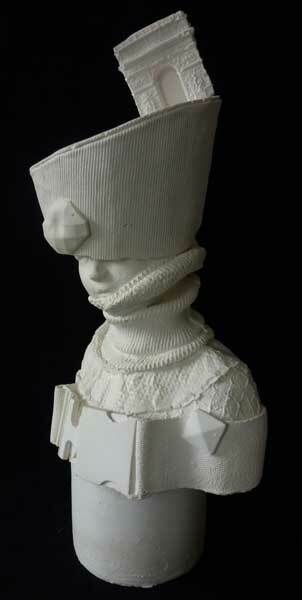 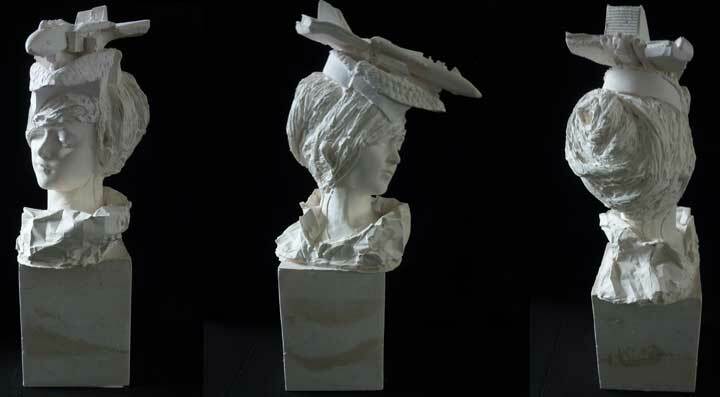 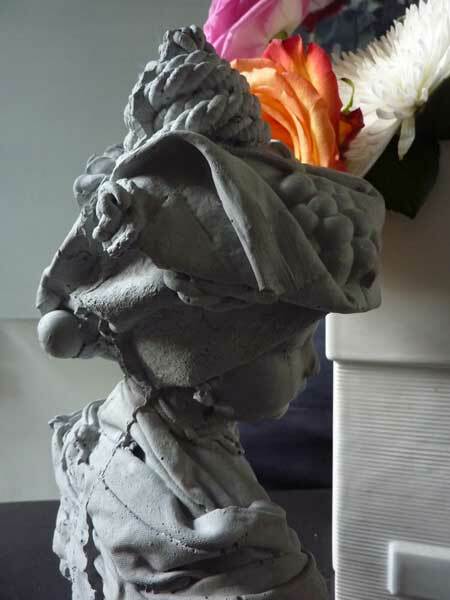 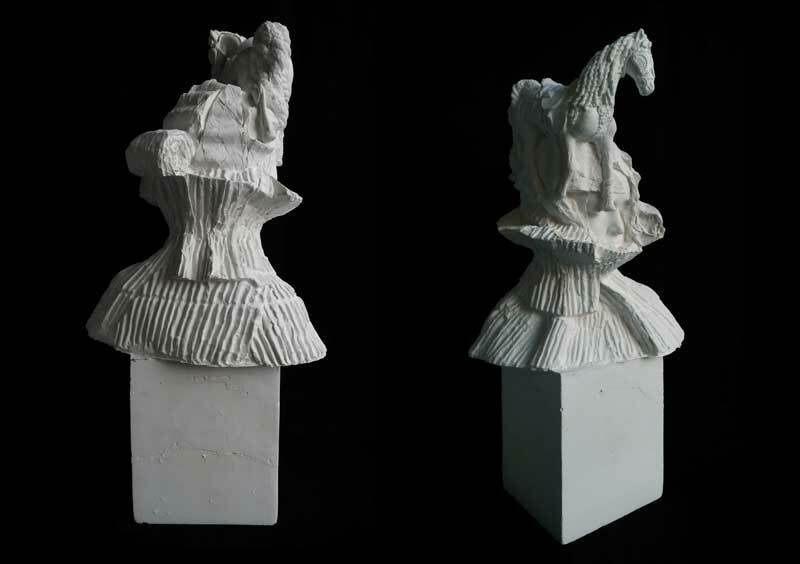 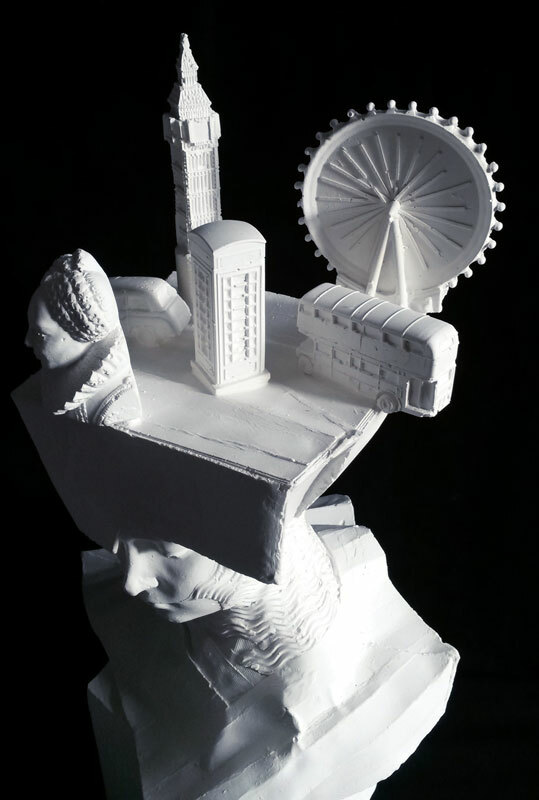 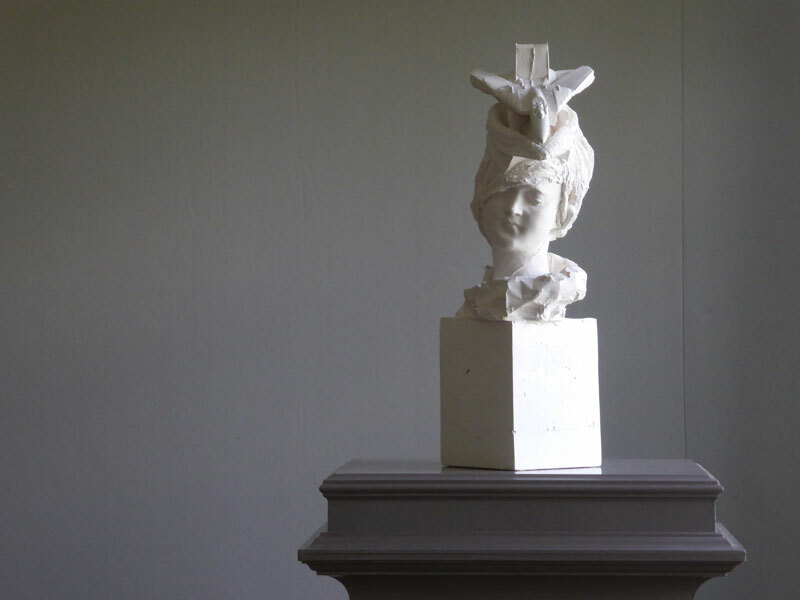 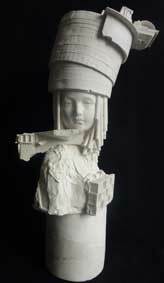 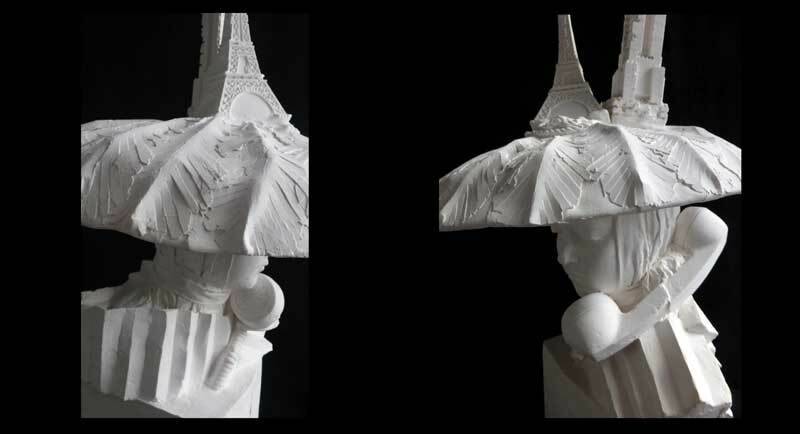 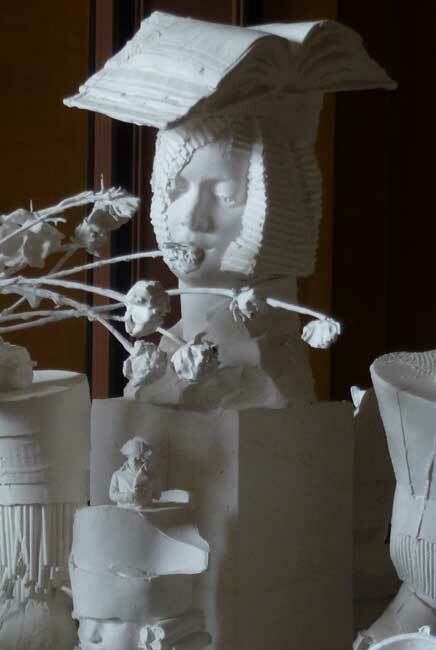 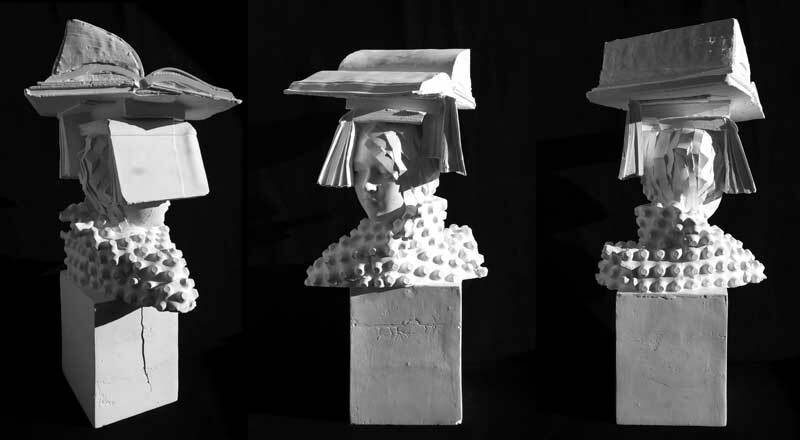 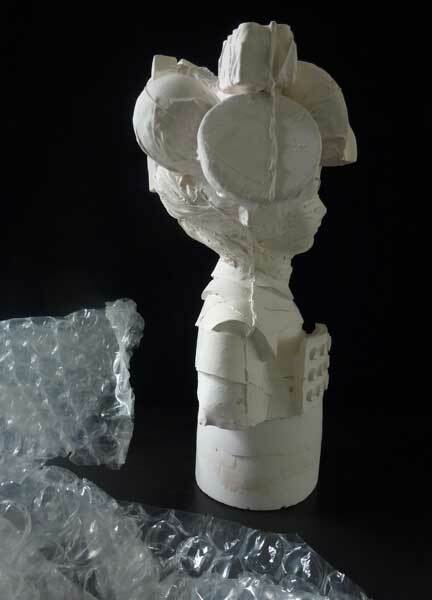 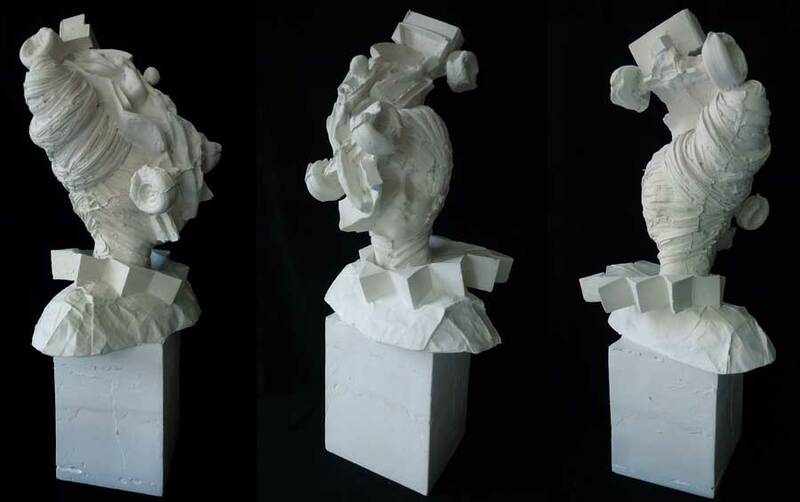 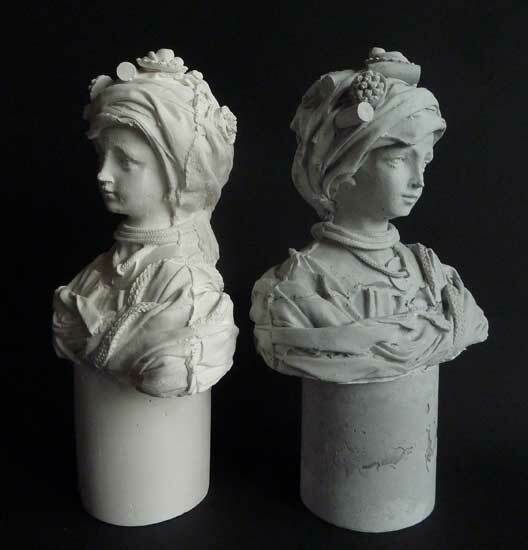 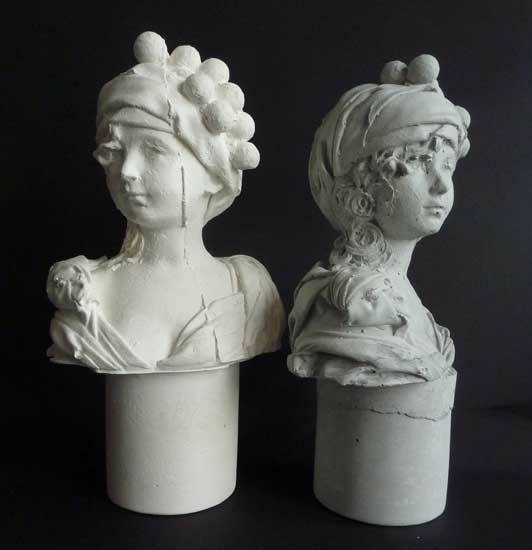 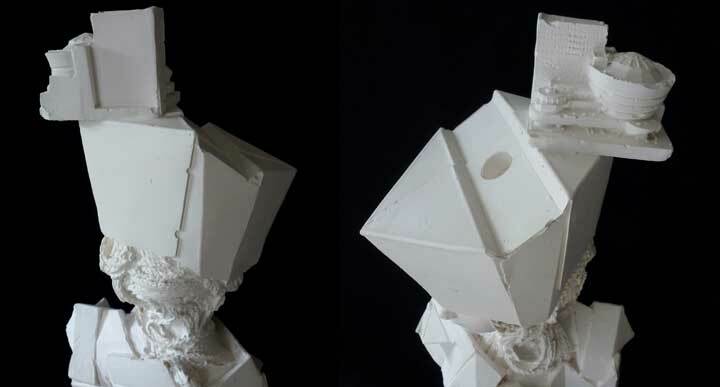 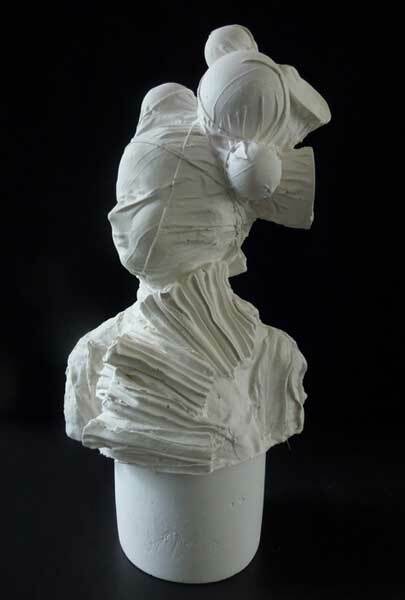 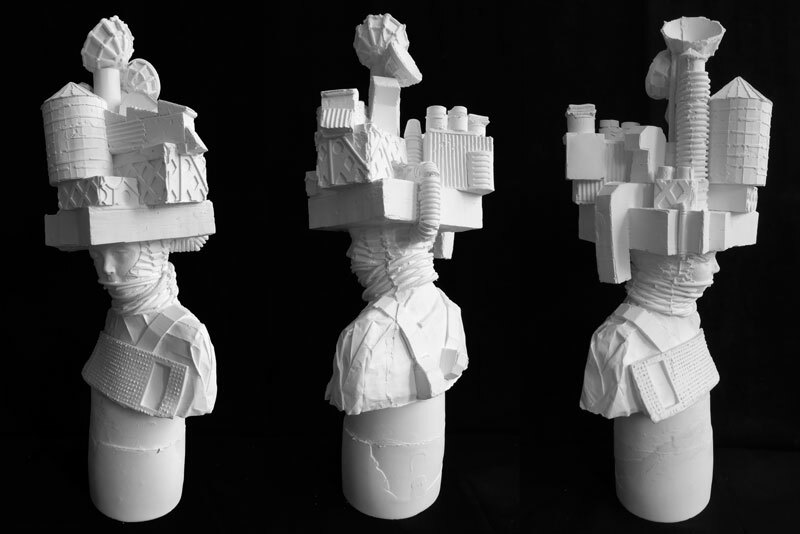 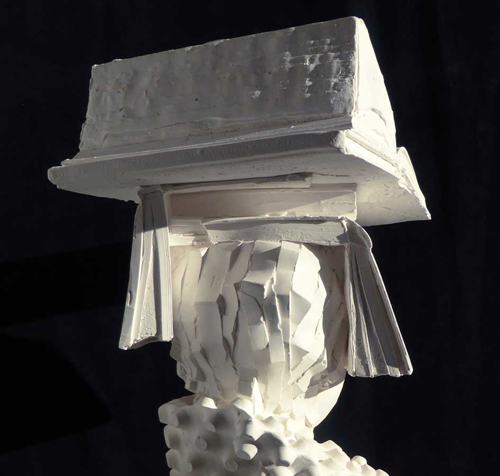 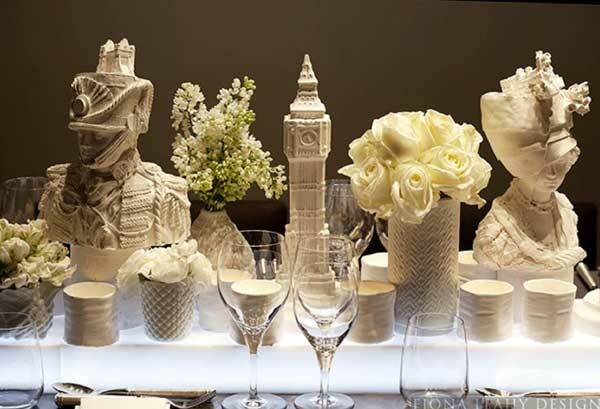 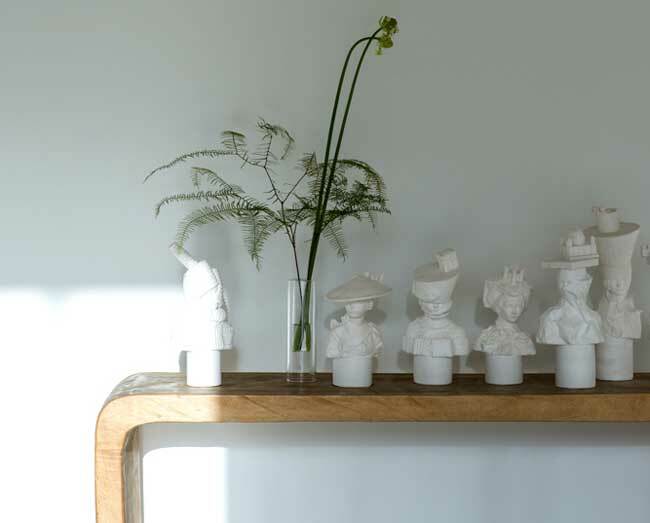 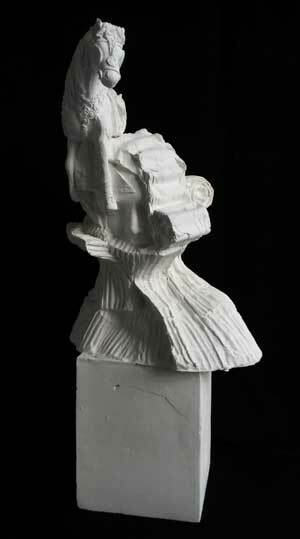 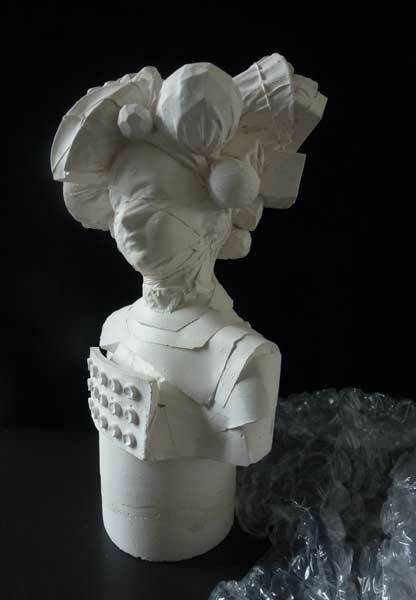 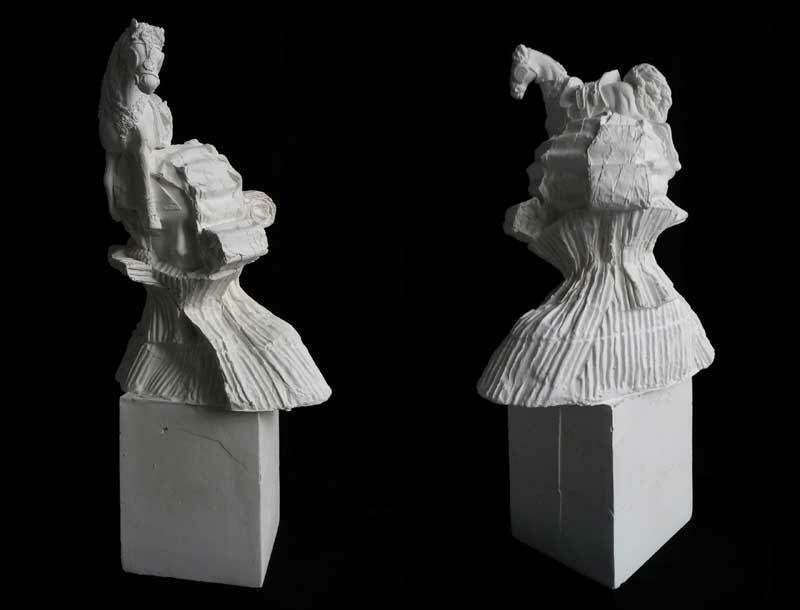 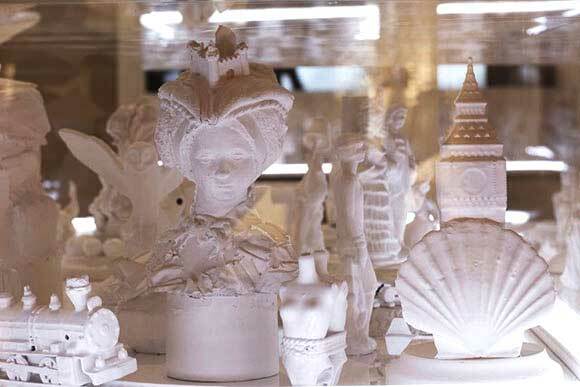 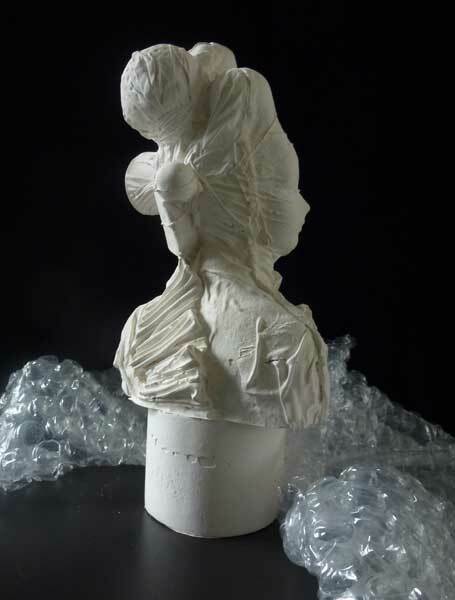 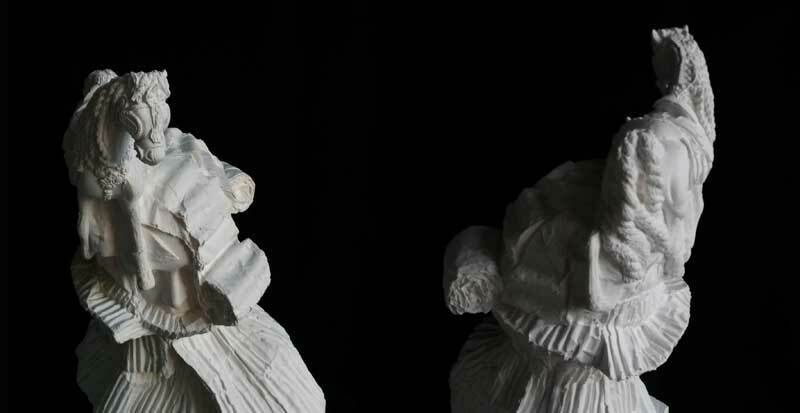 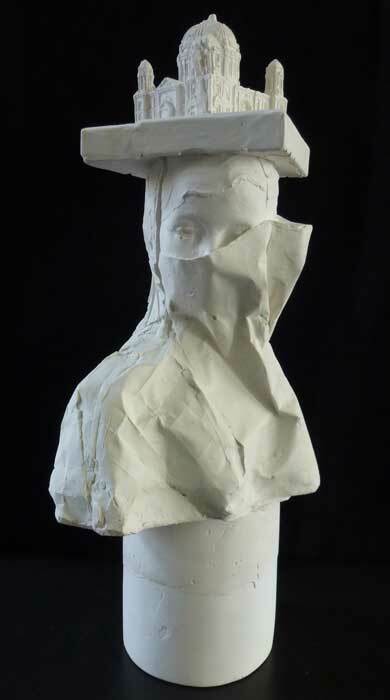 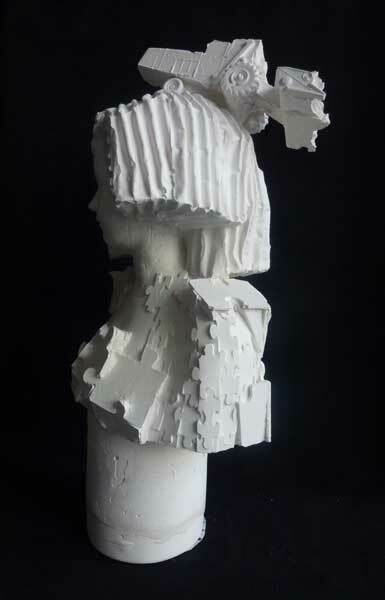 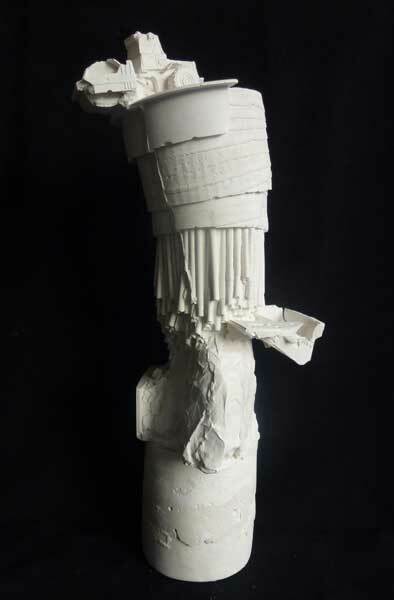 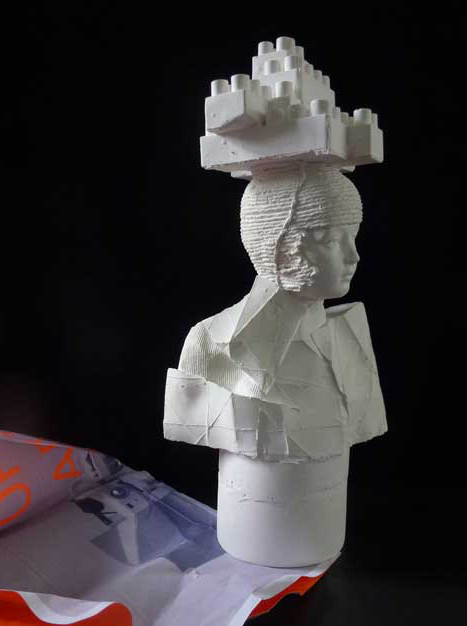 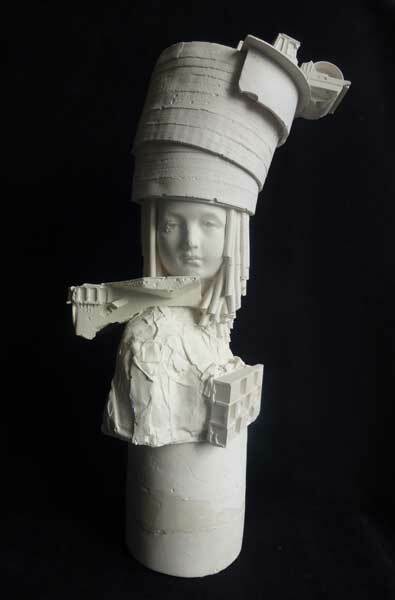 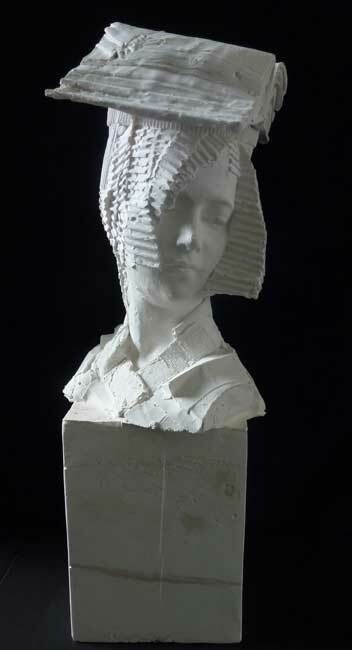 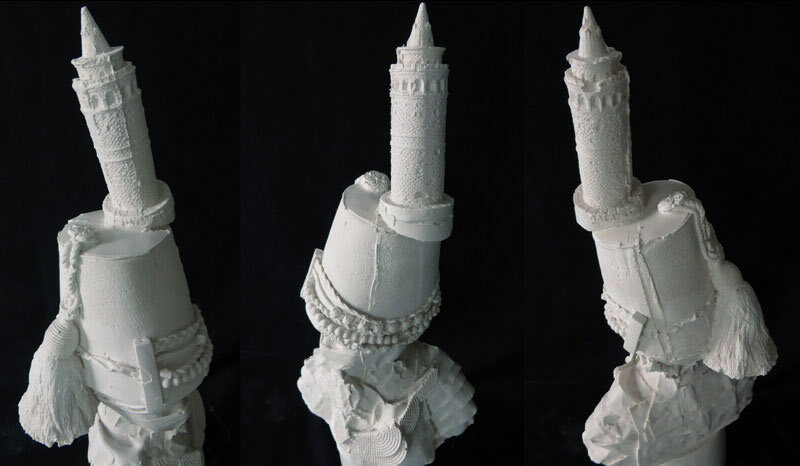 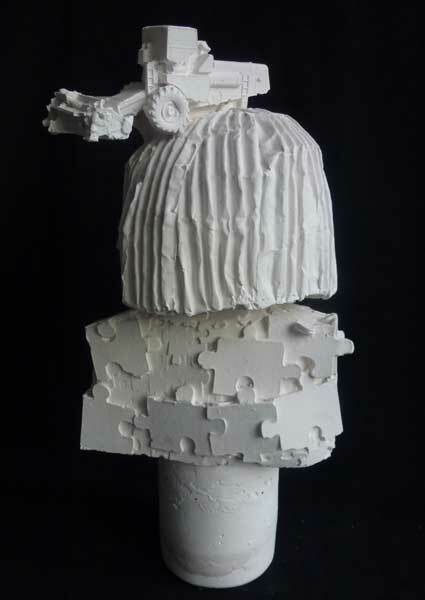 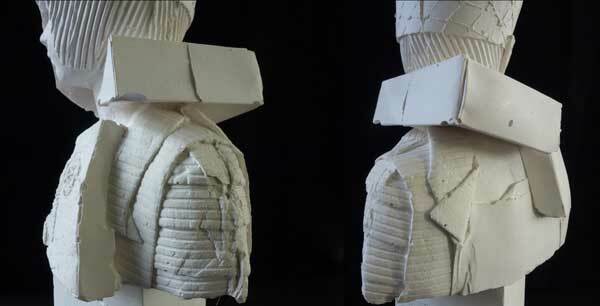 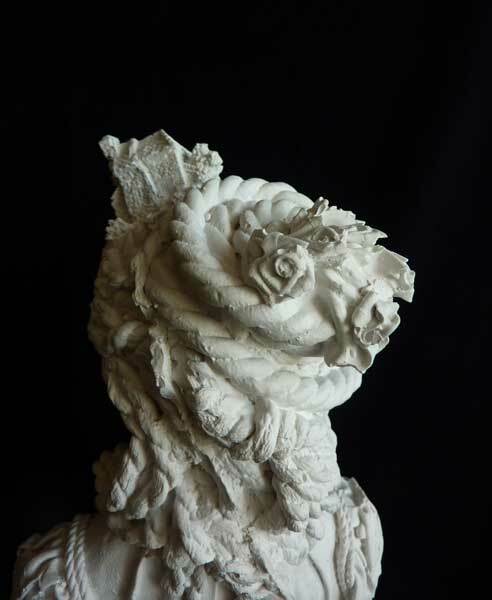 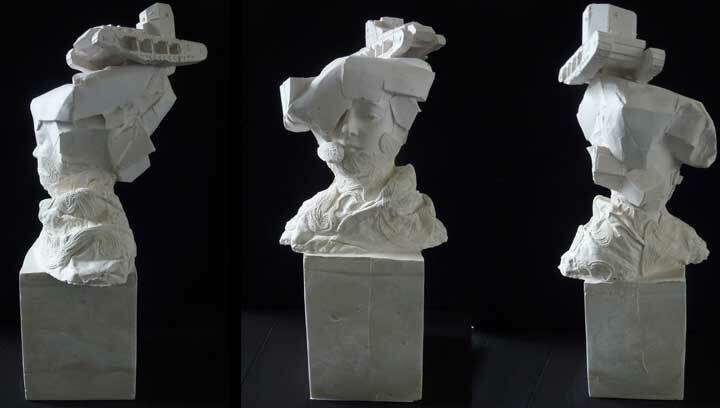 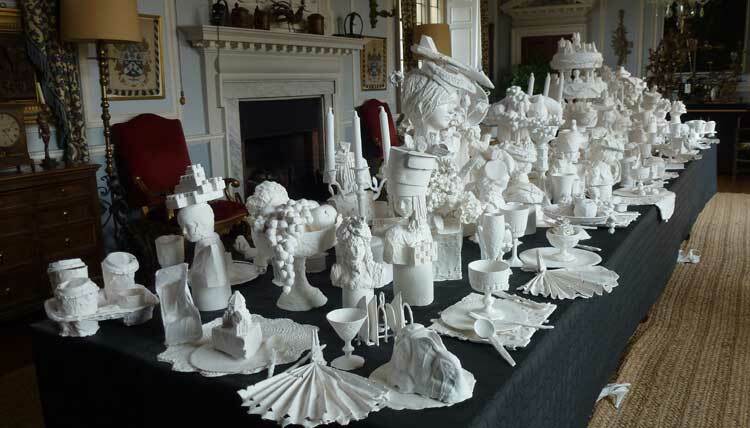 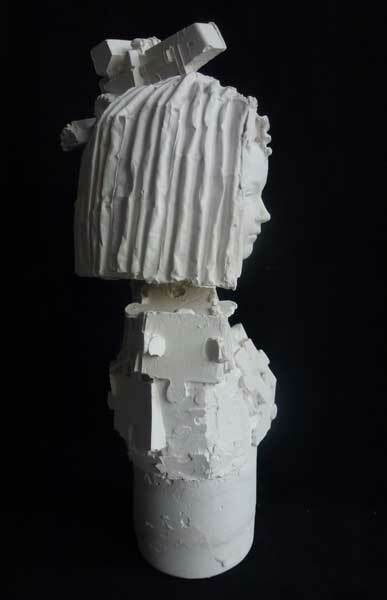 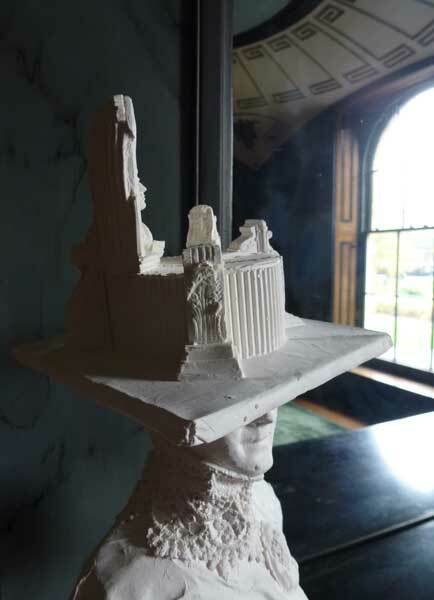 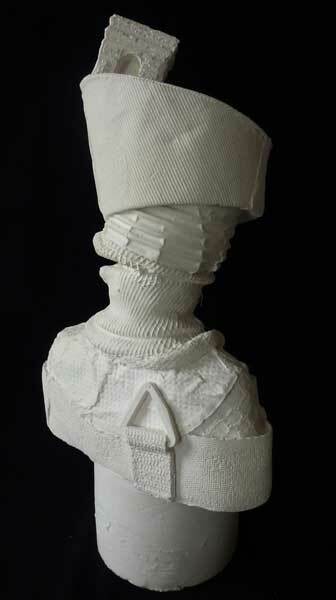 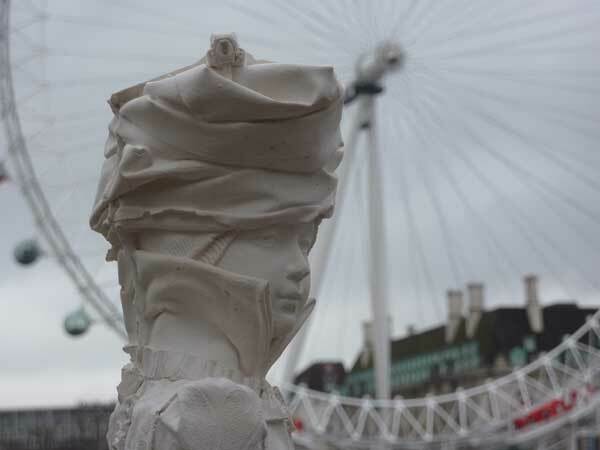 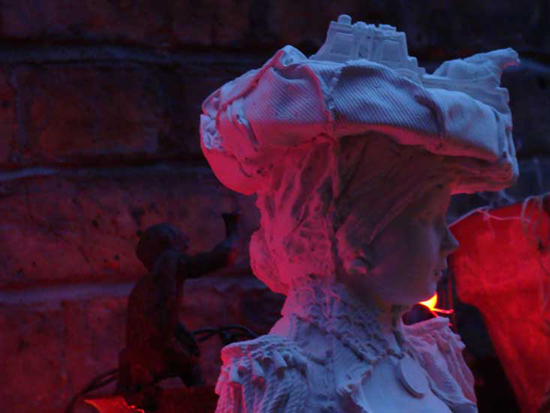 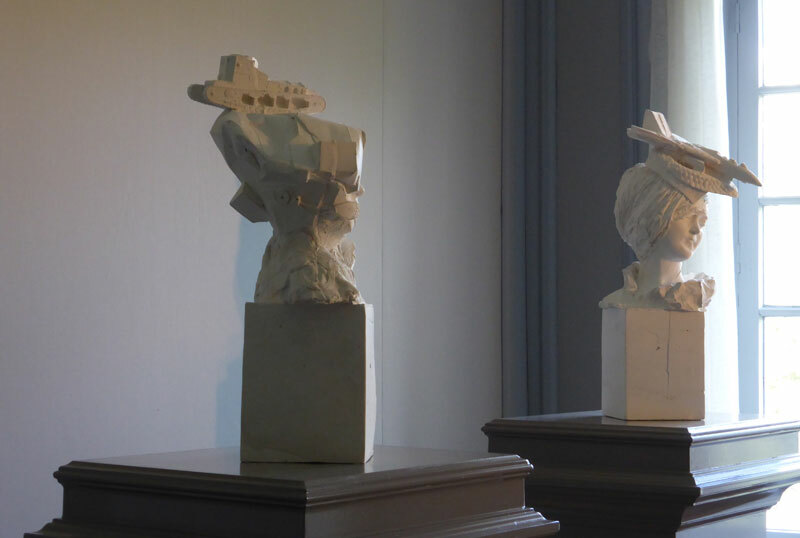 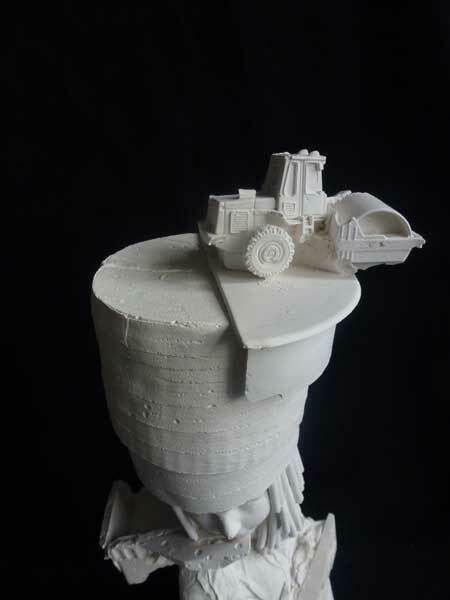 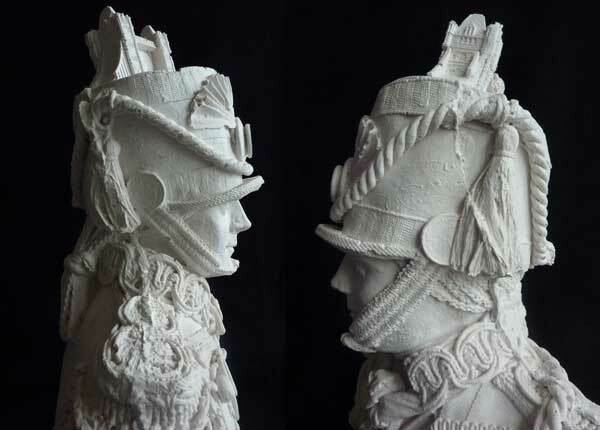 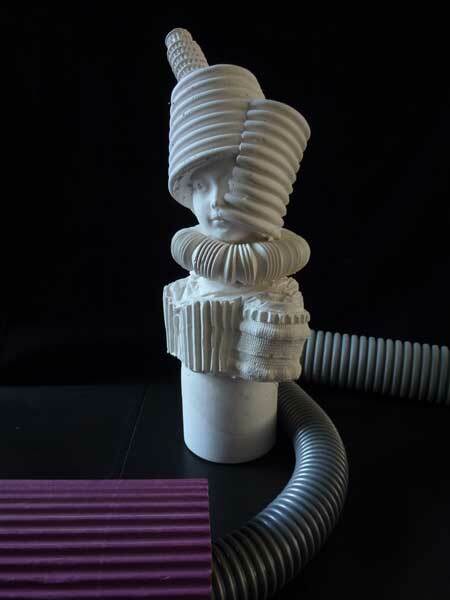 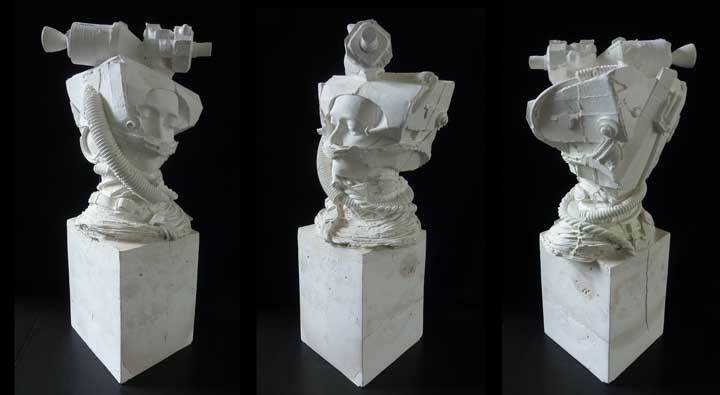 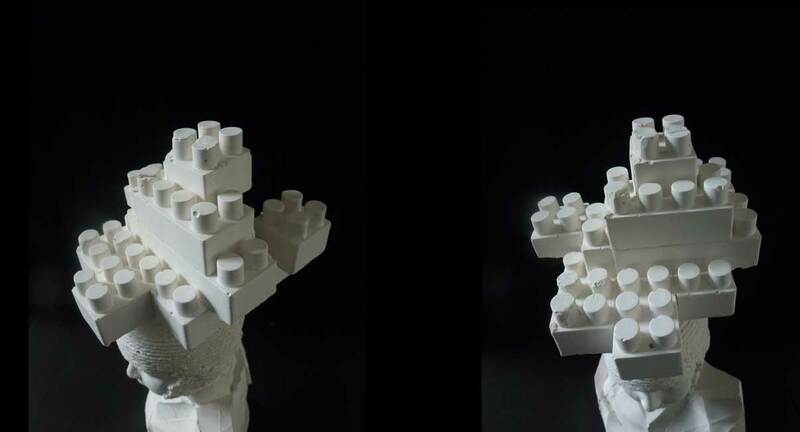 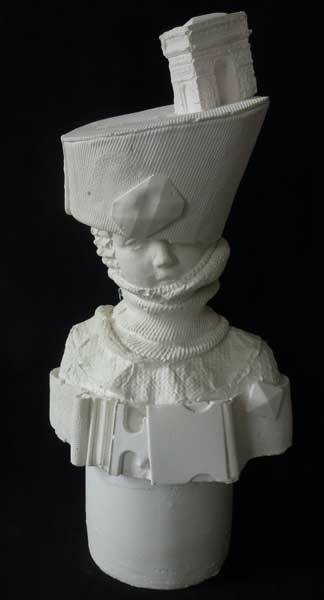 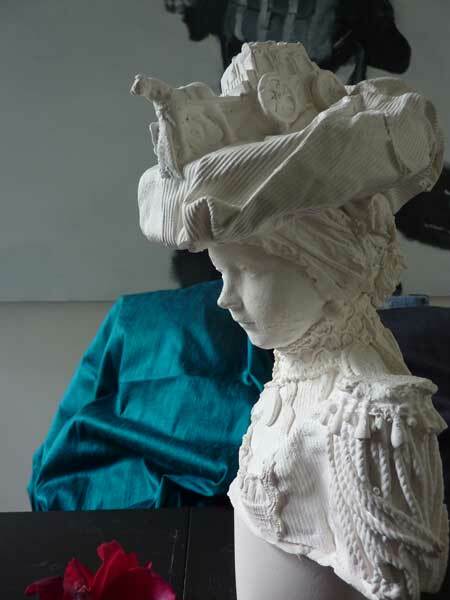 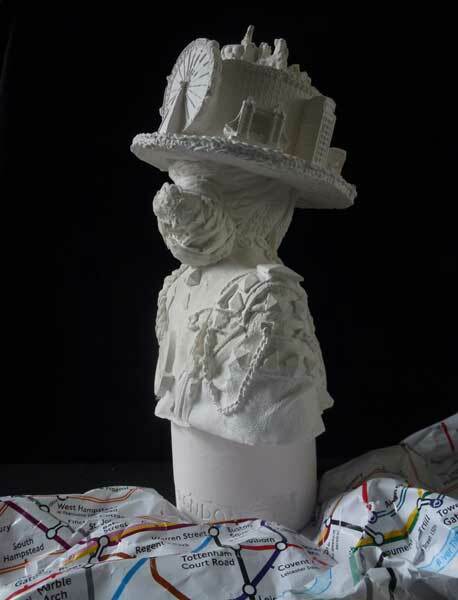 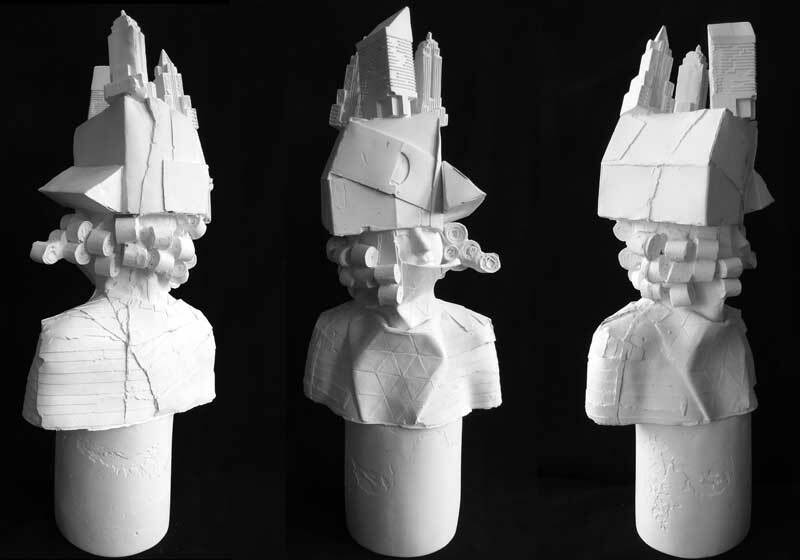 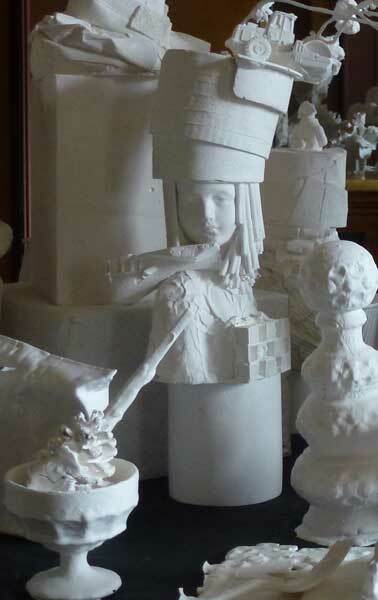 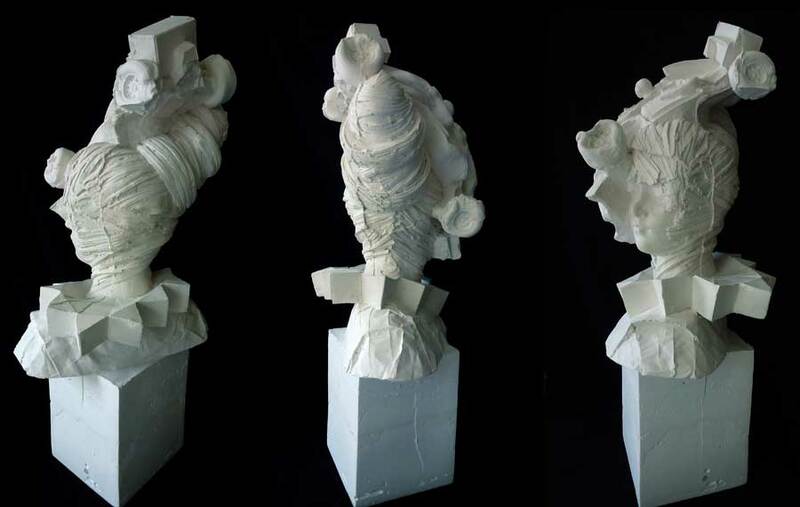 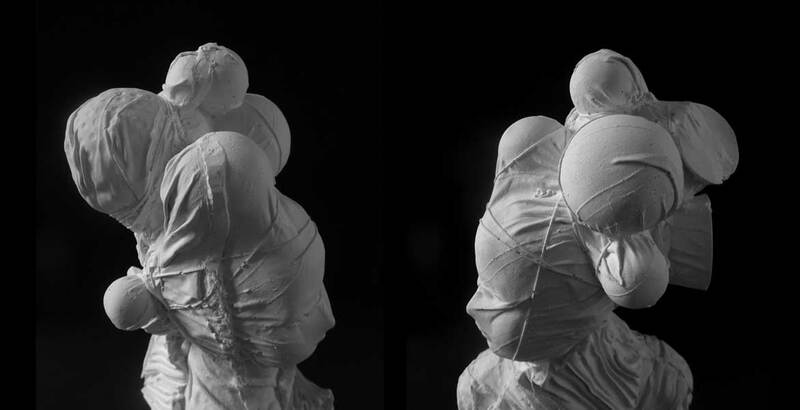 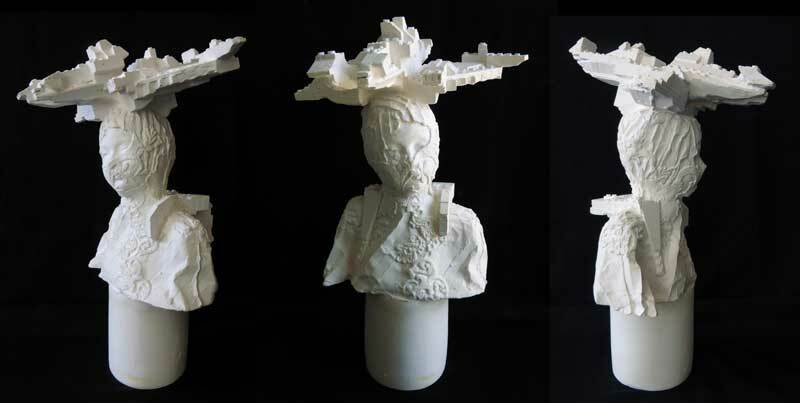 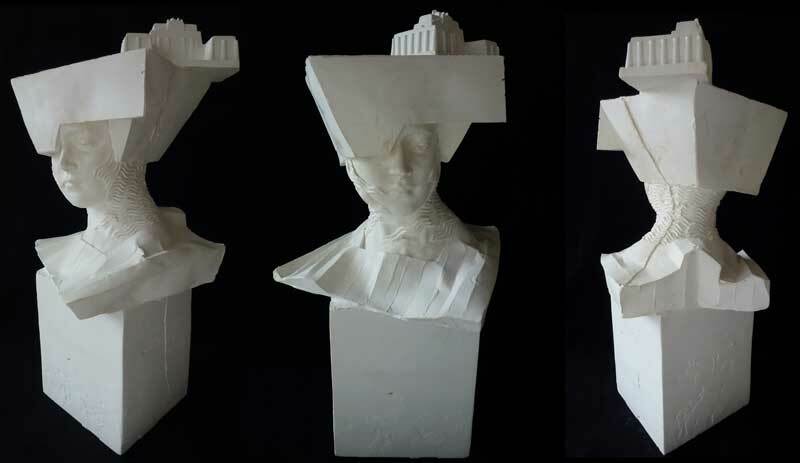 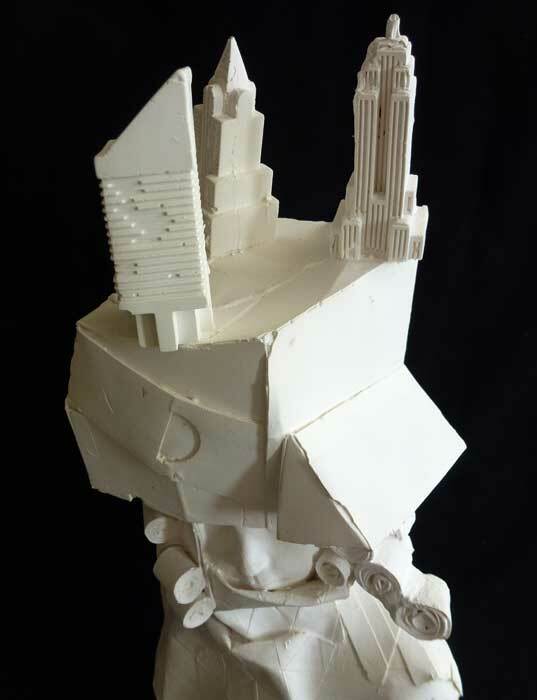 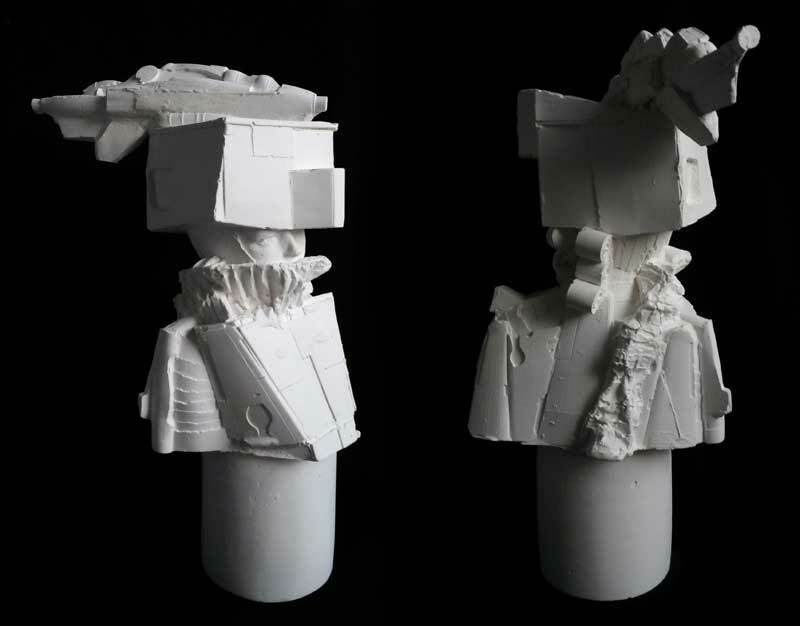 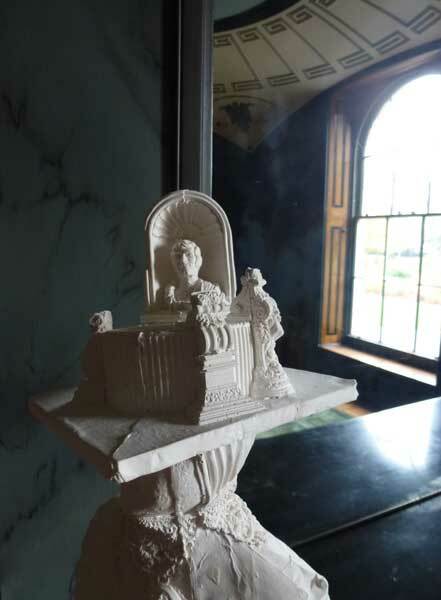 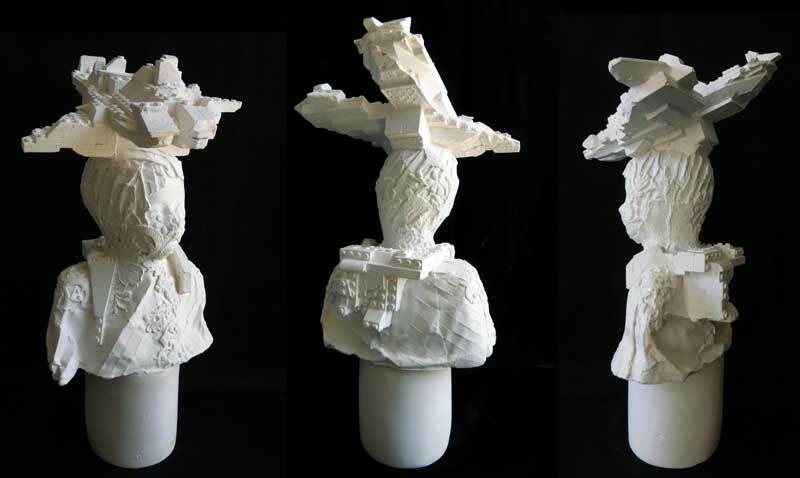 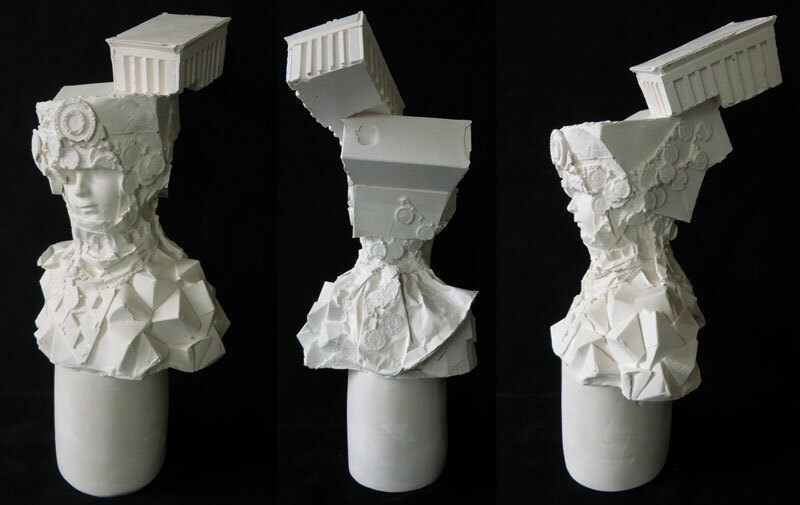 To construct the original sculpture from which the plaster casts are taken, I first ‘collage’ together all kinds of materials and found objects – fabrics, haberdashery, model buildings and vehicles, plastic packaging, corrugated card, paper, electrical and plumbing parts and much else. 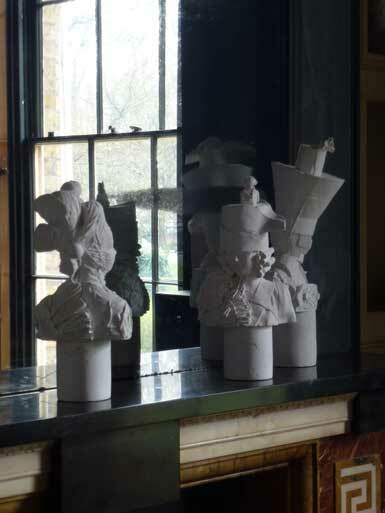 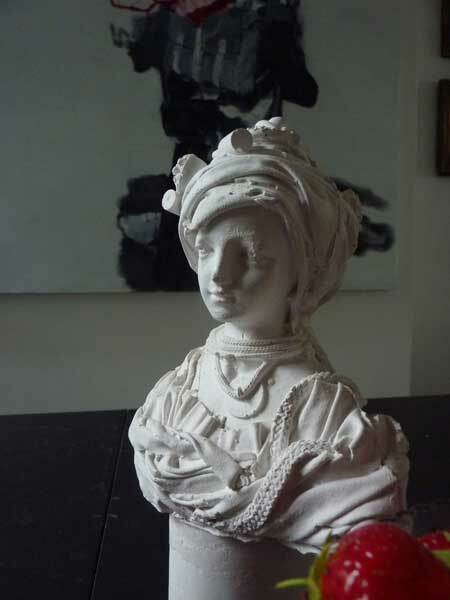 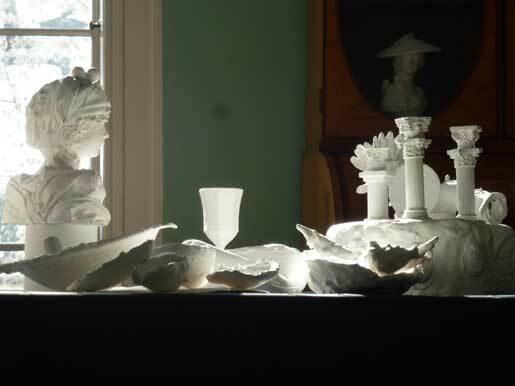 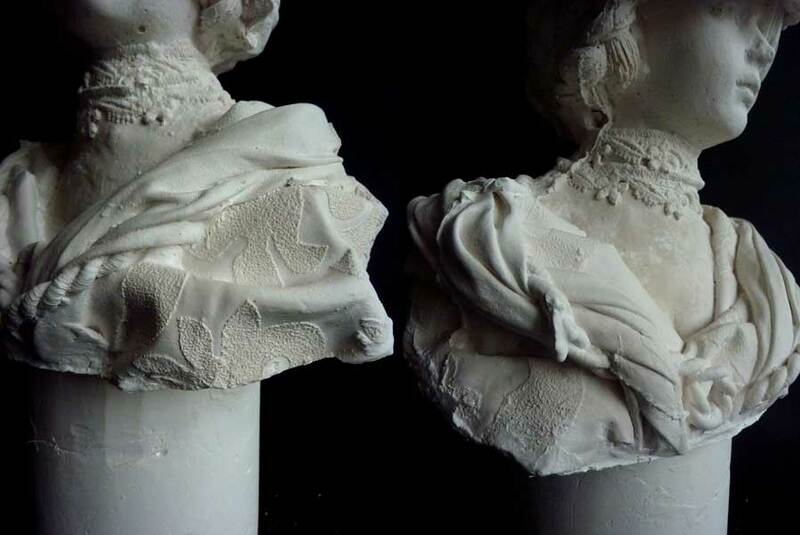 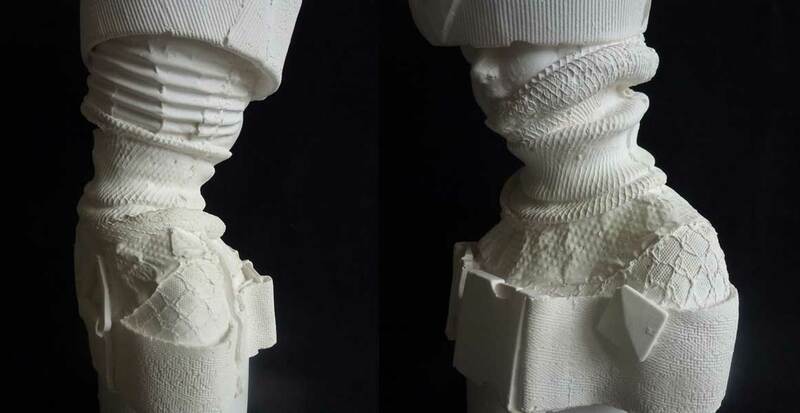 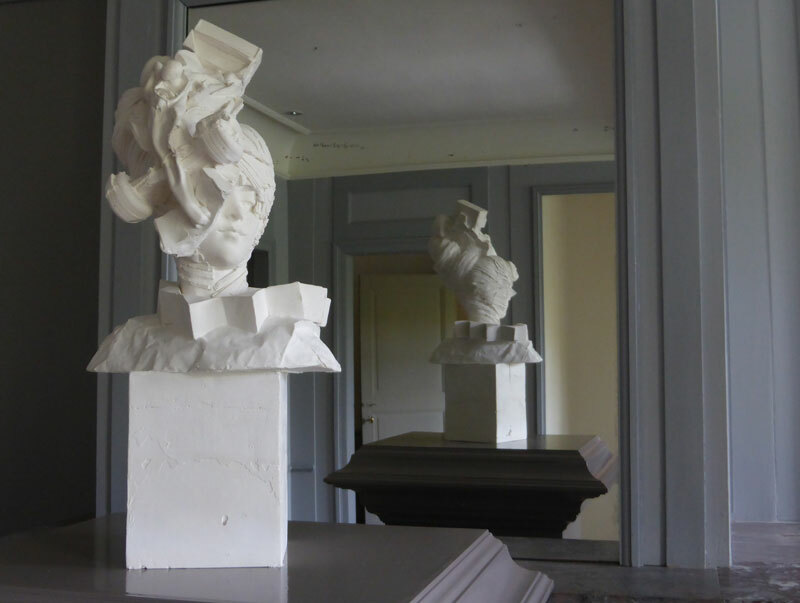 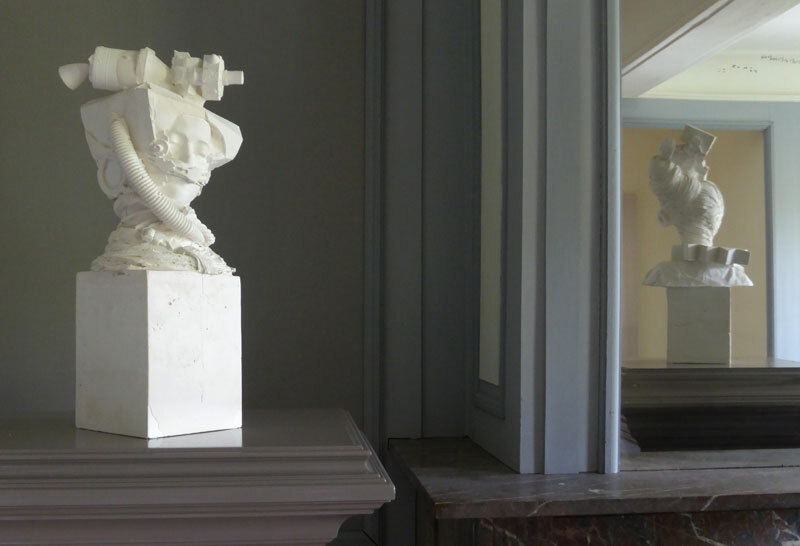 The plaster casts made from these originals pick up an amazing amount of texture and detail giving the sculptures a strange air of realism. 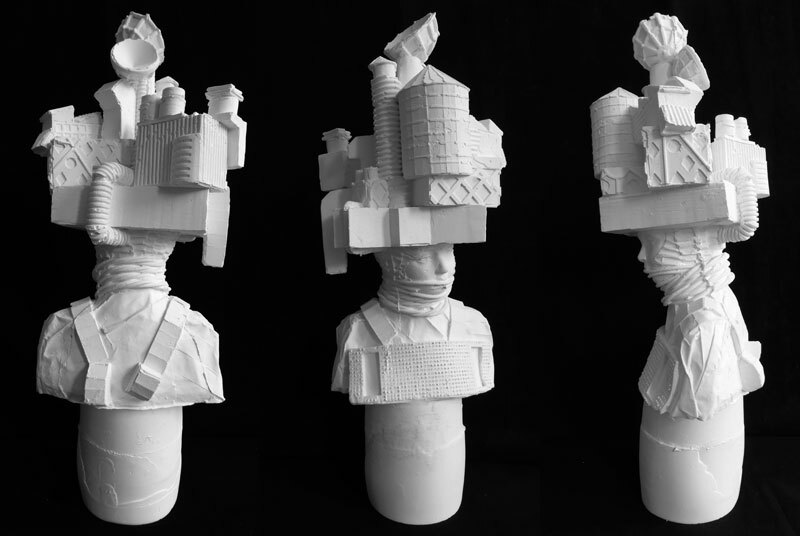 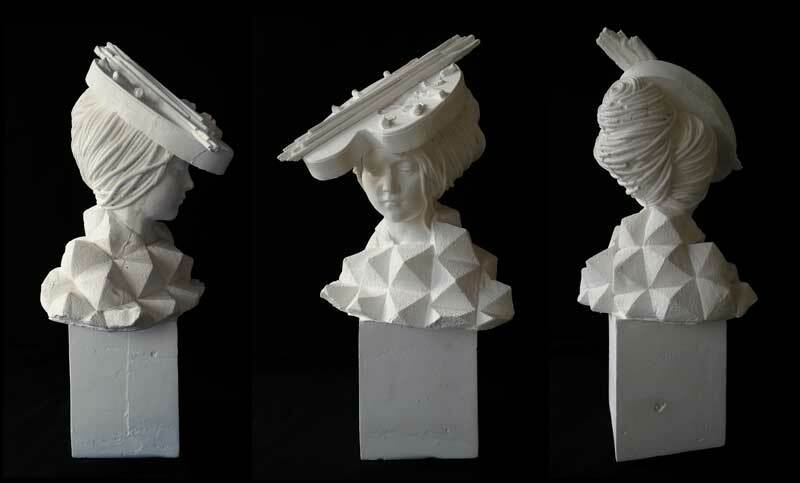 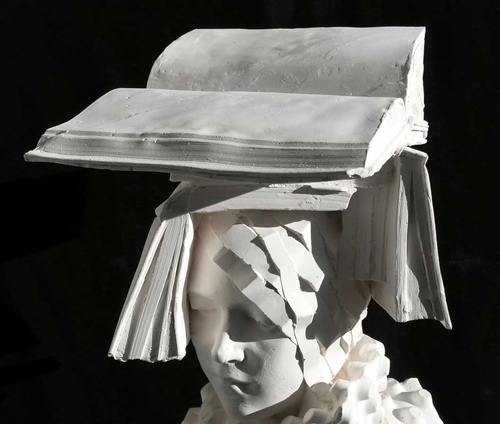 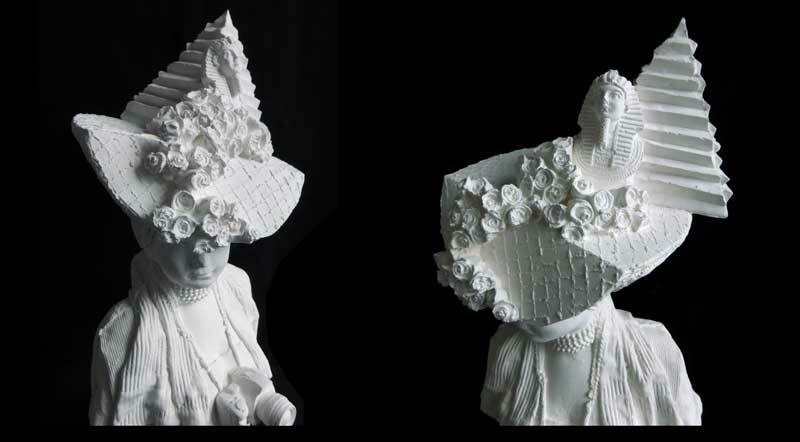 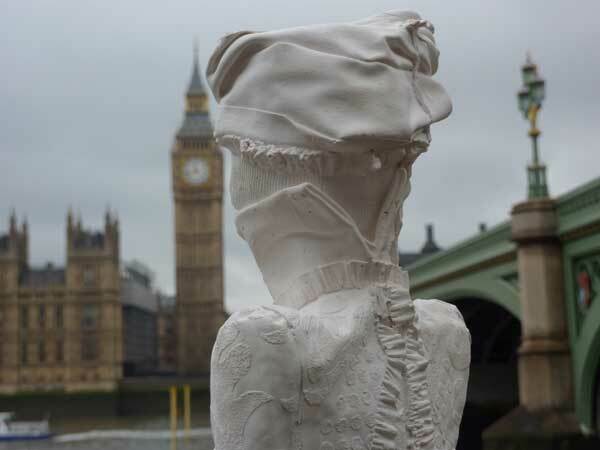 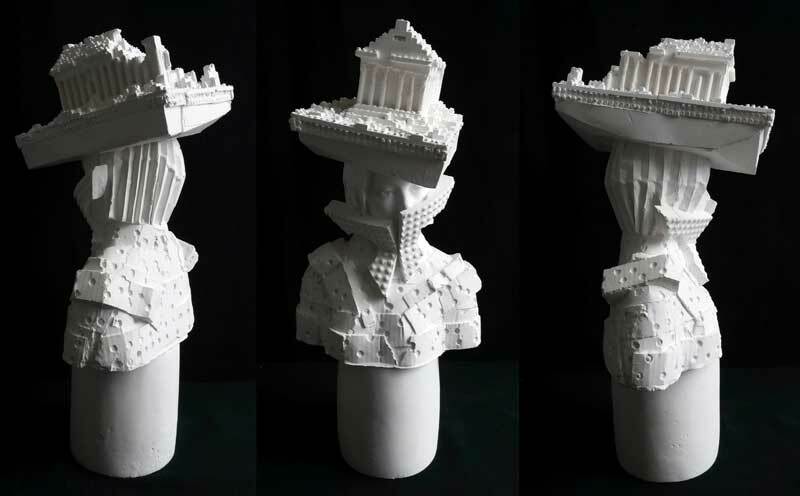 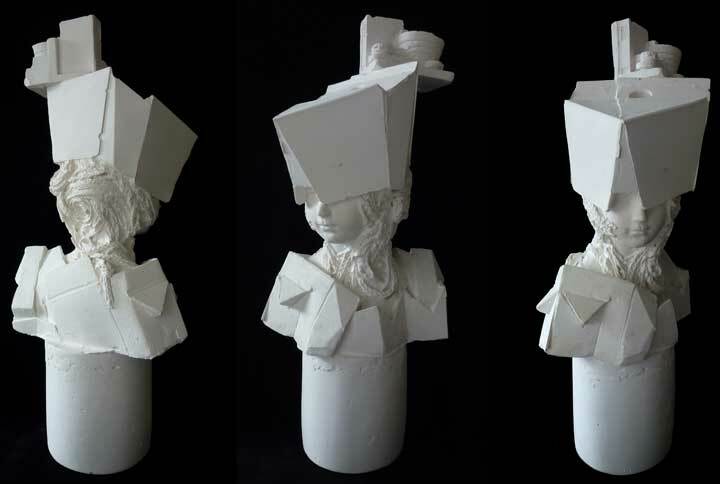 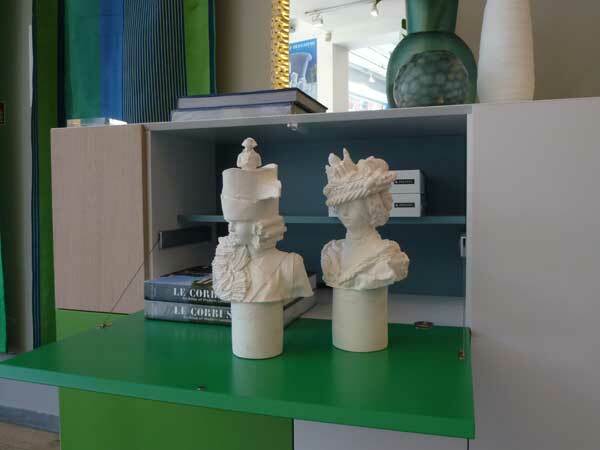 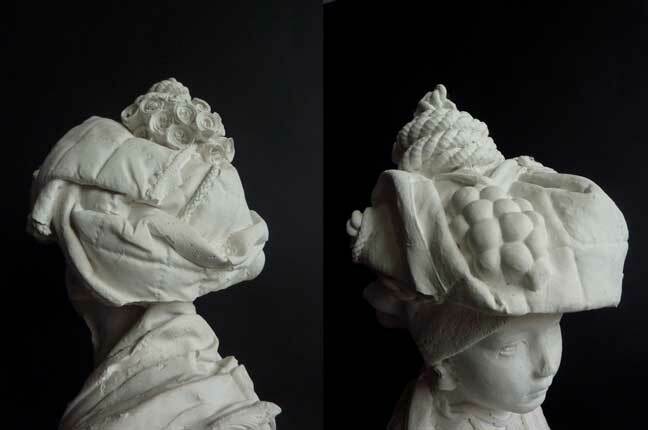 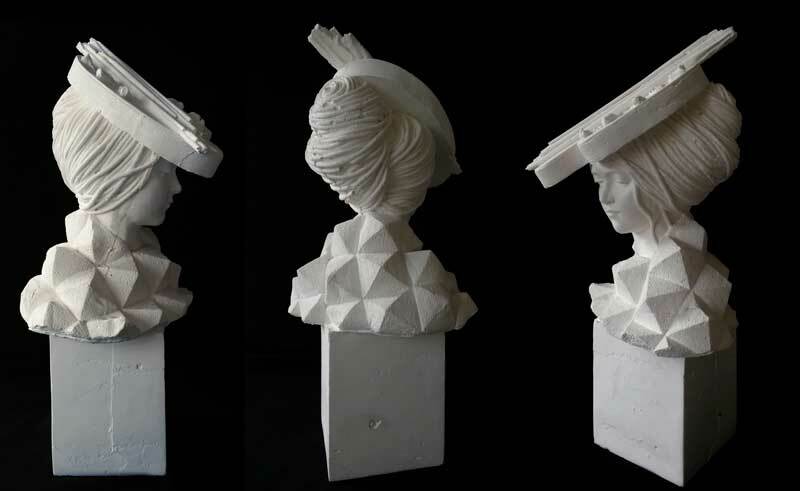 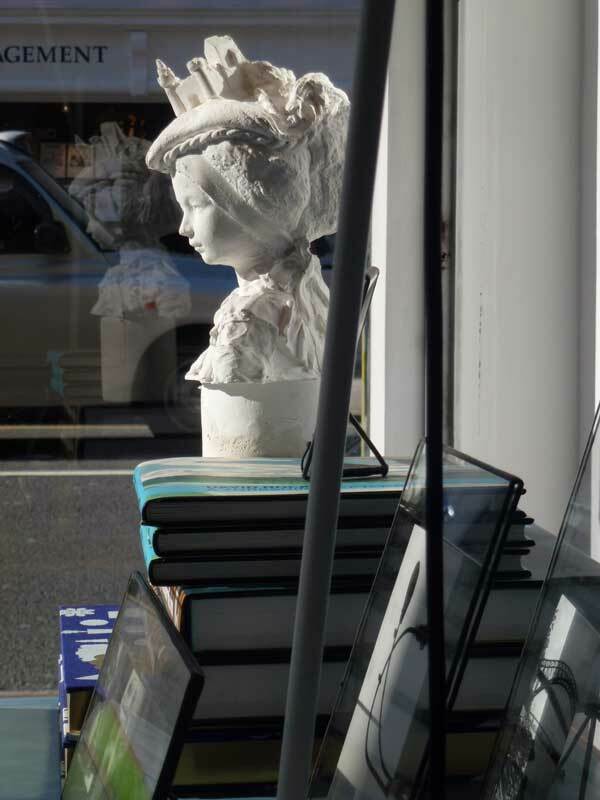 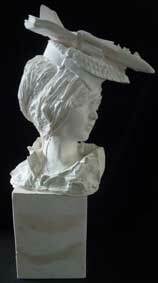 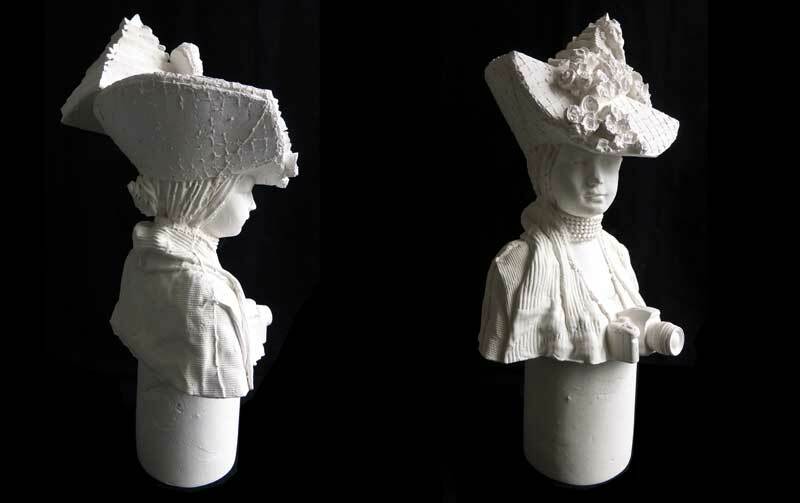 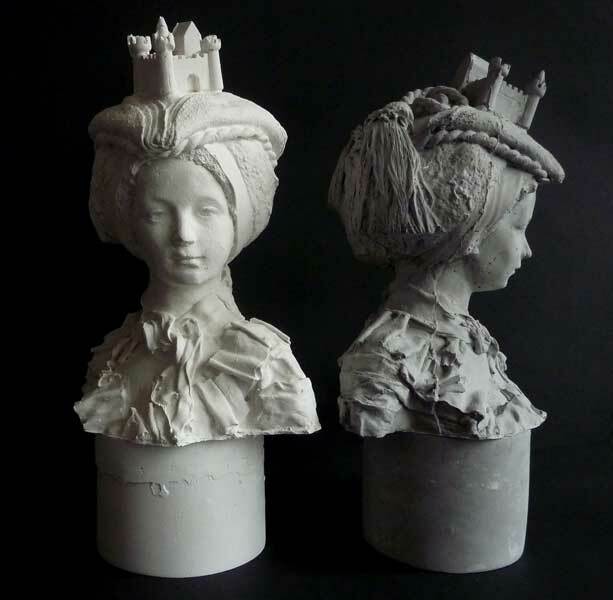 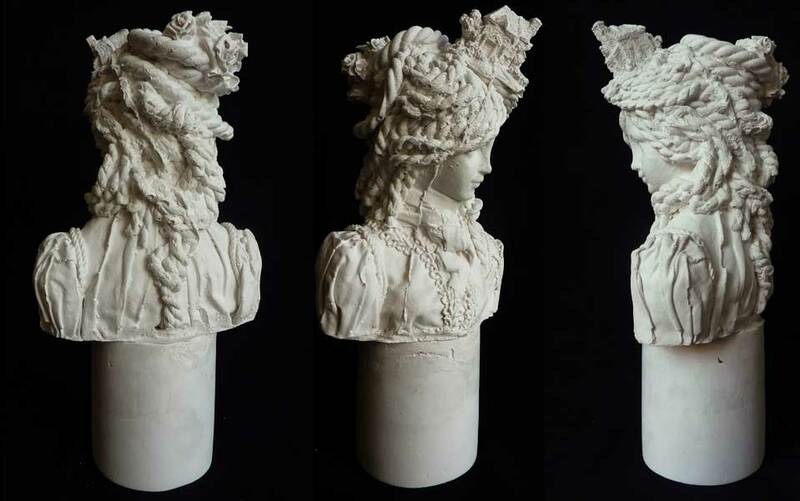 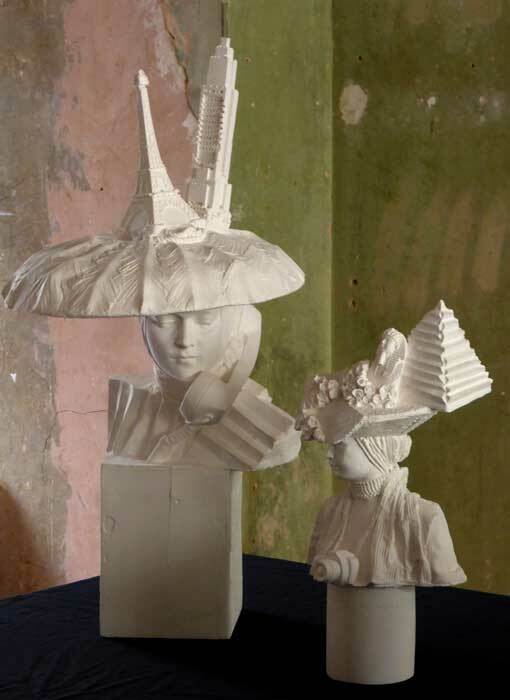 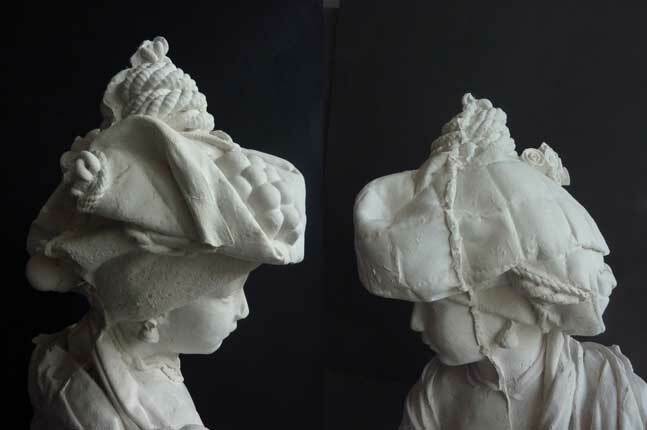 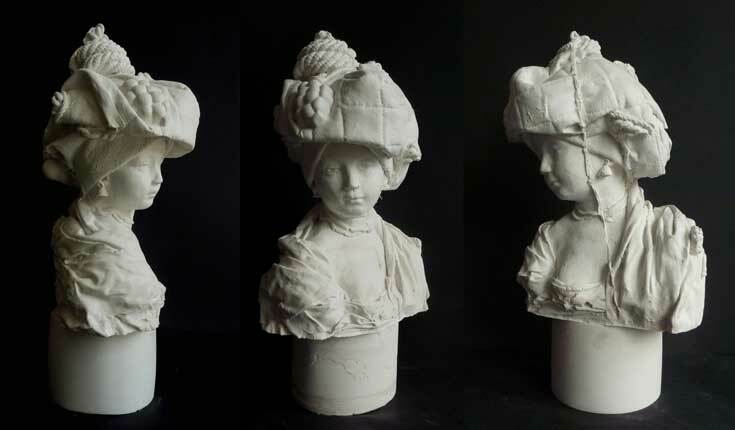 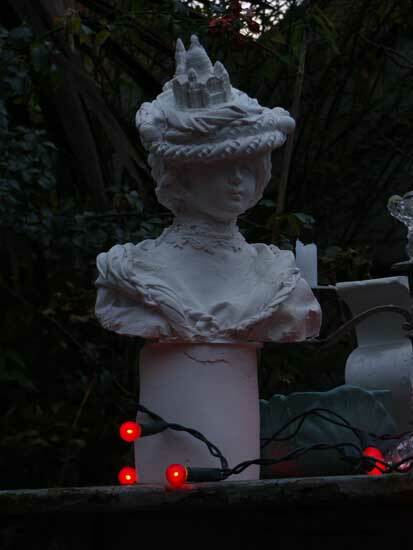 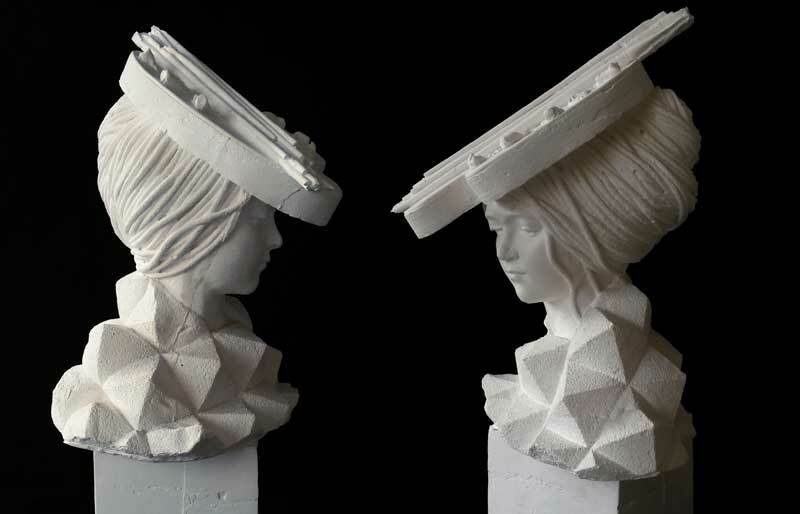 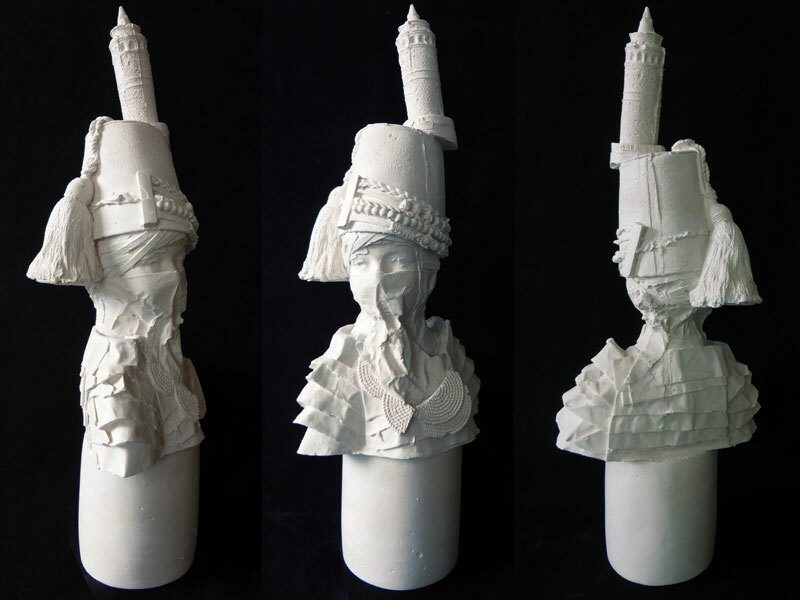 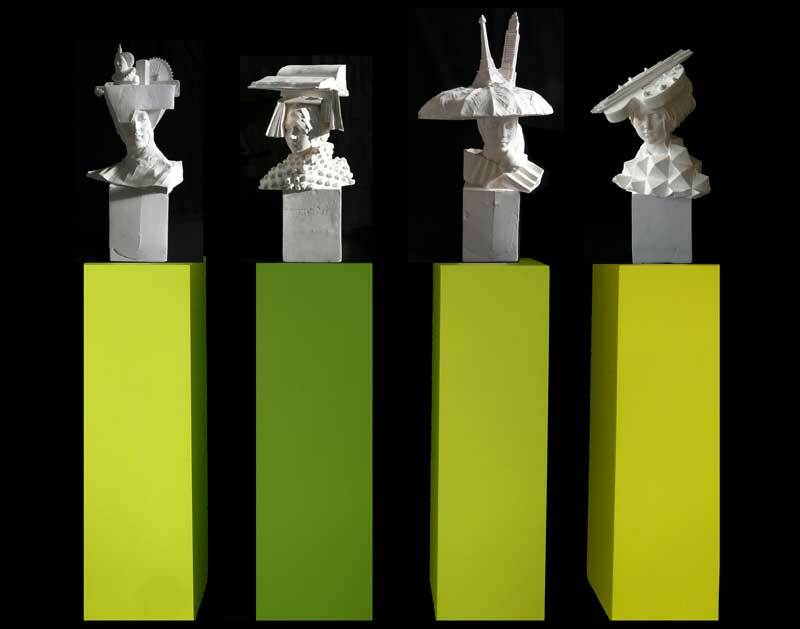 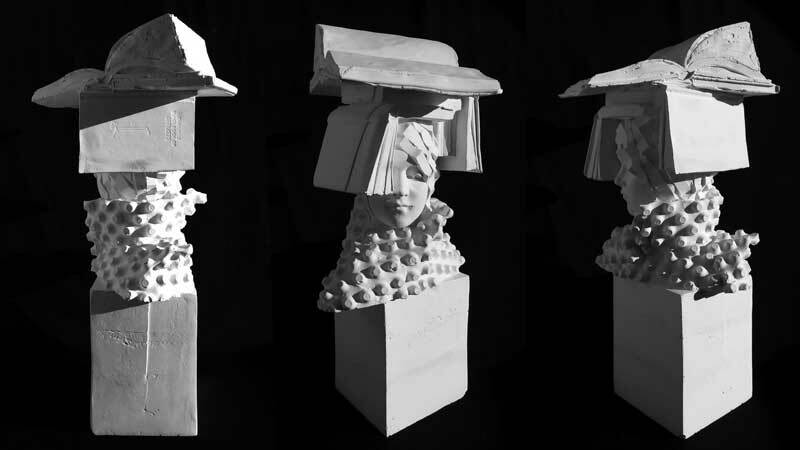 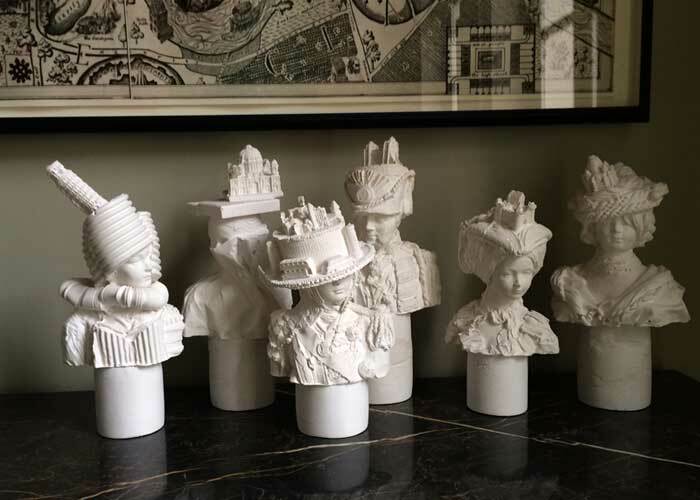 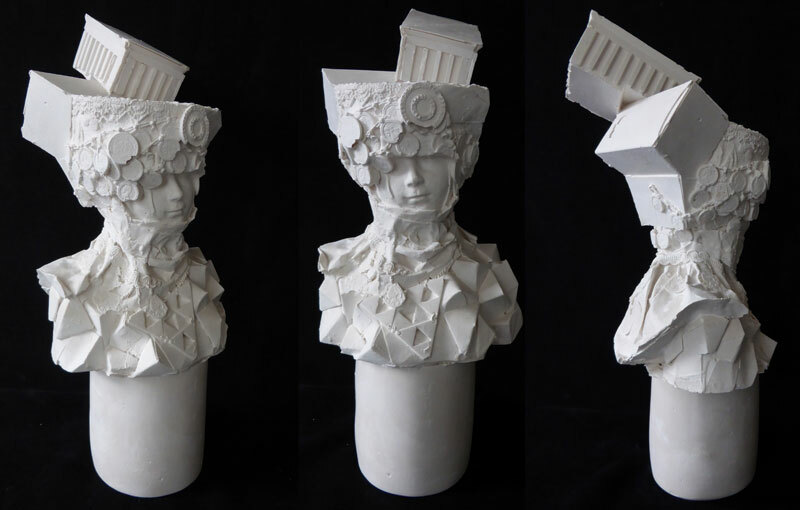 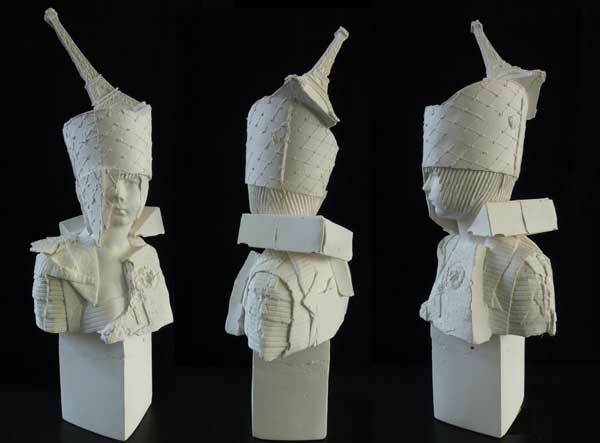 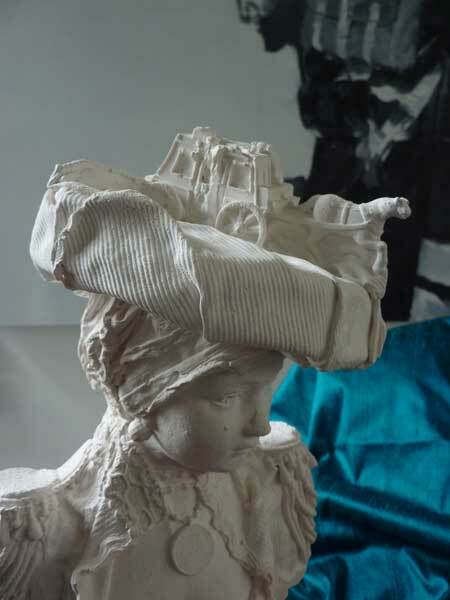 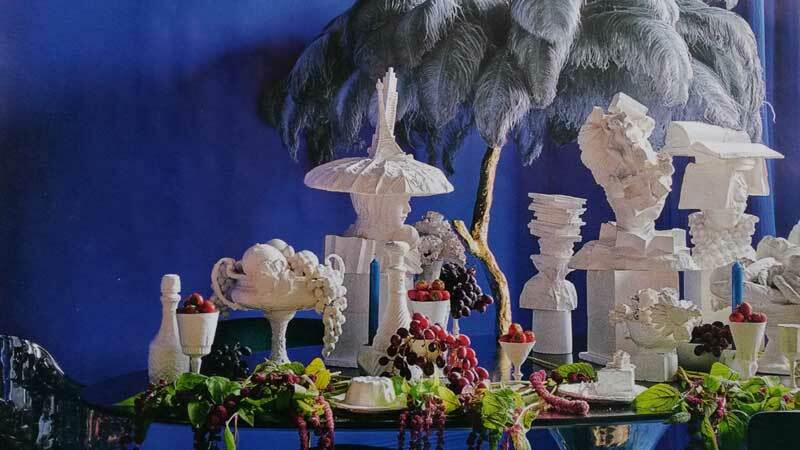 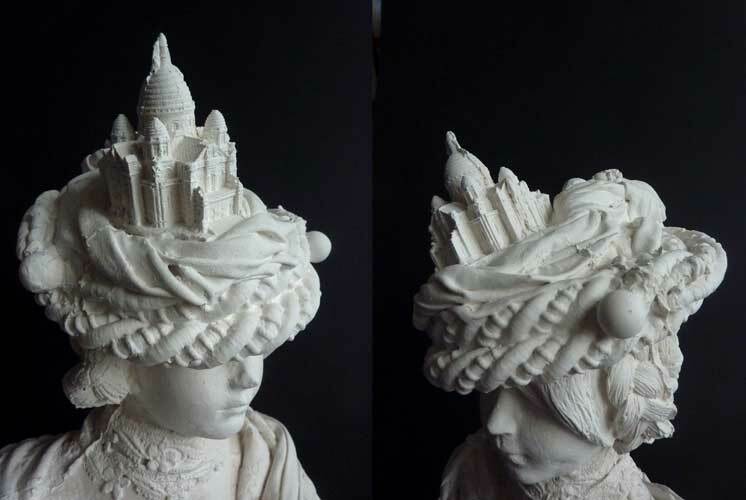 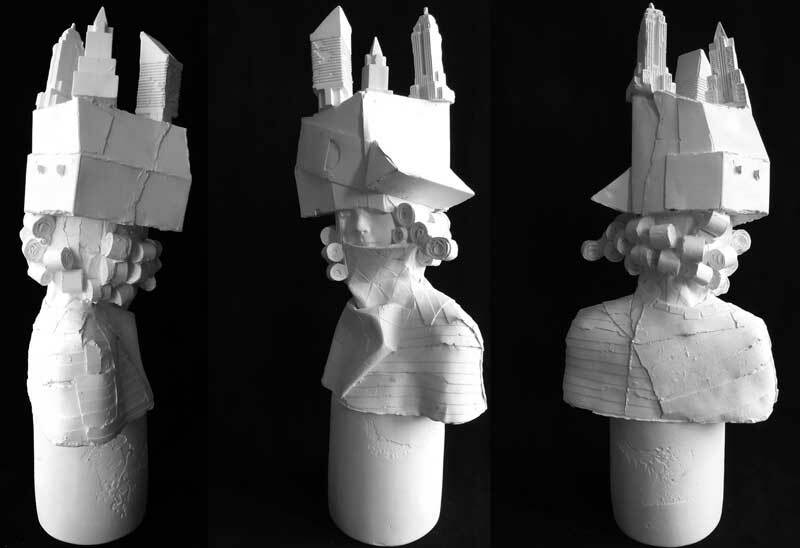 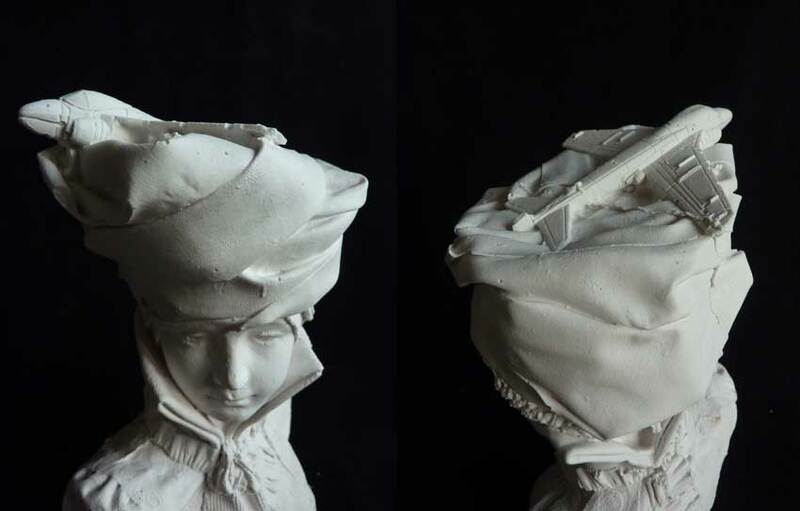 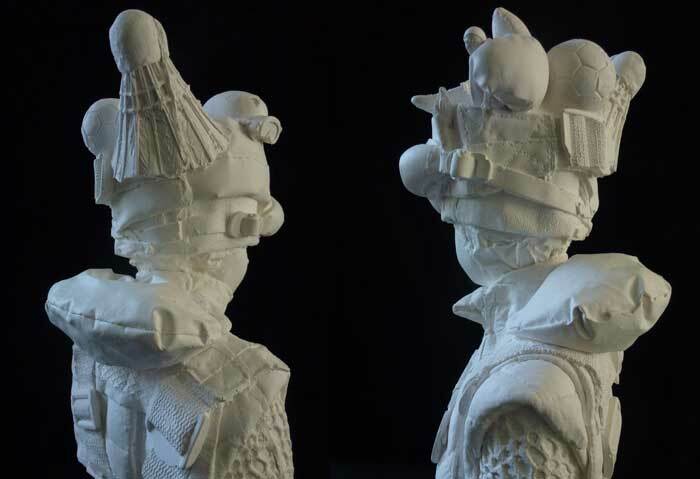 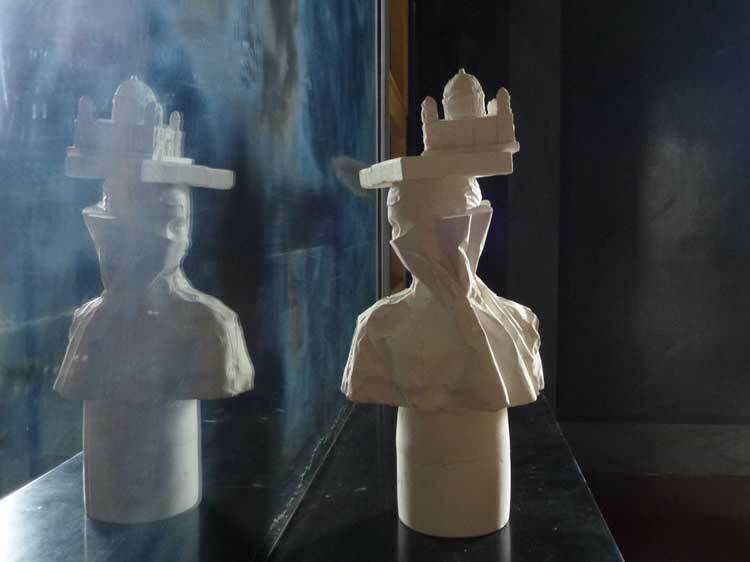 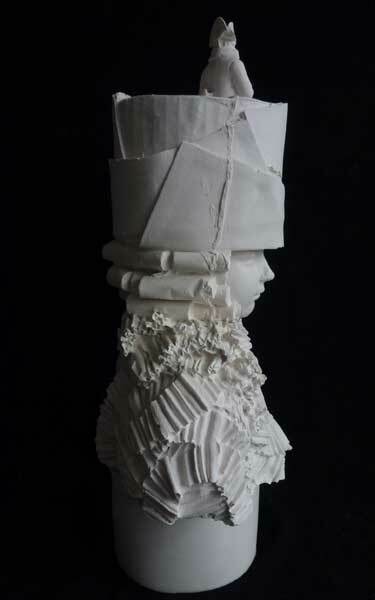 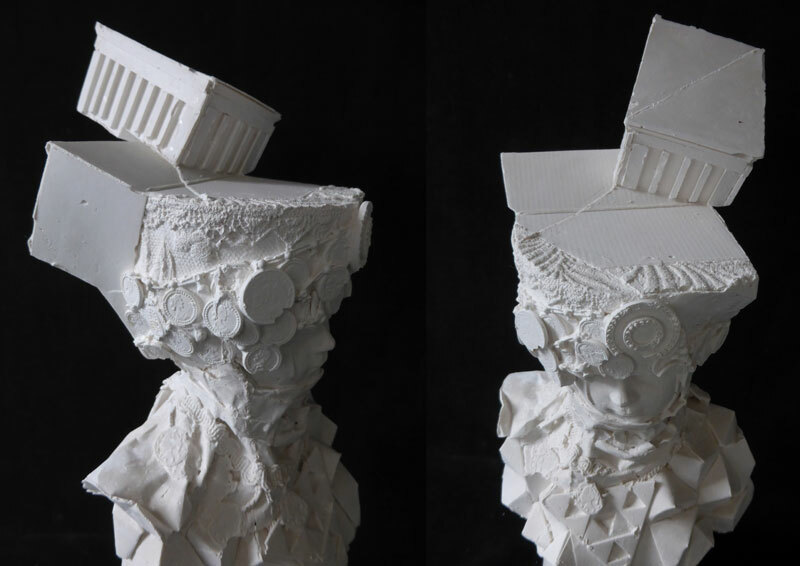 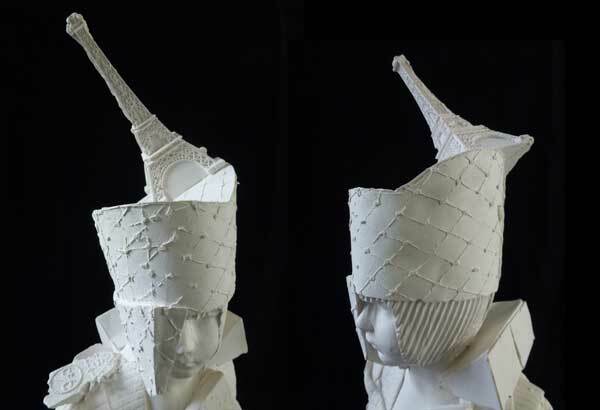 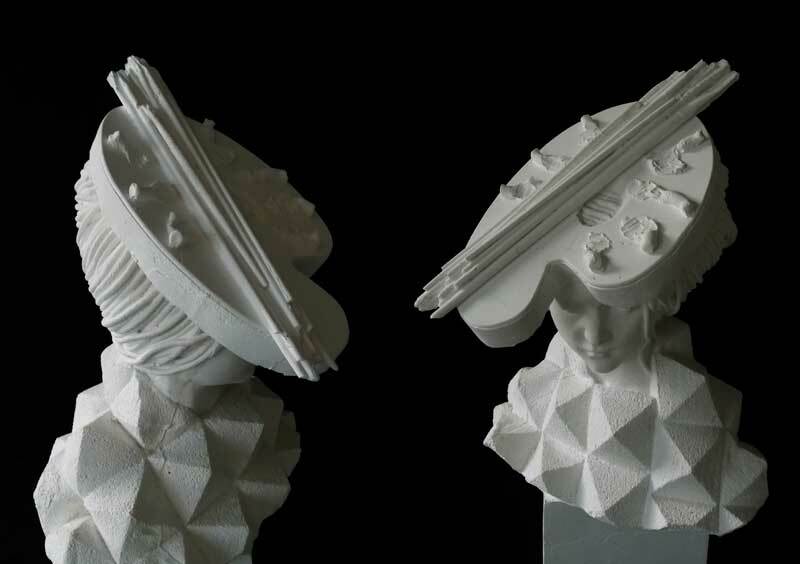 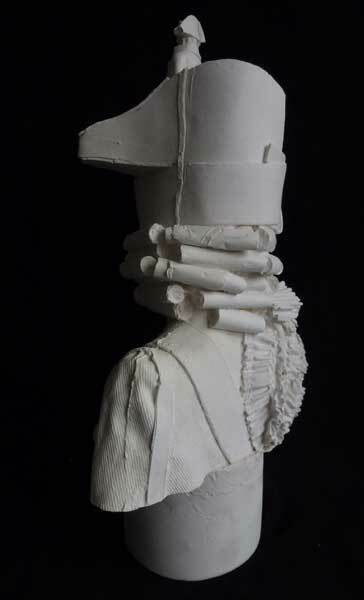 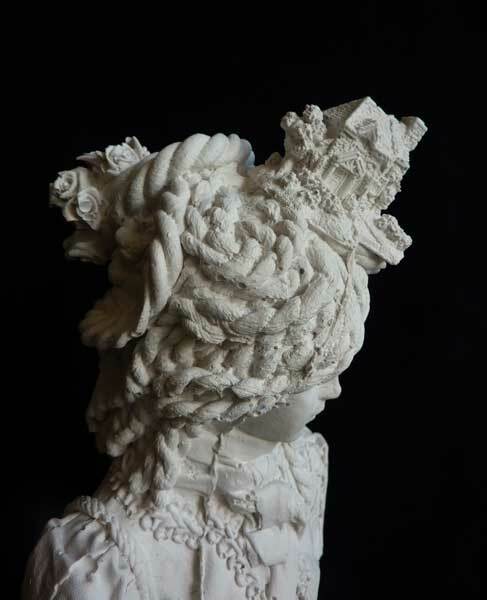 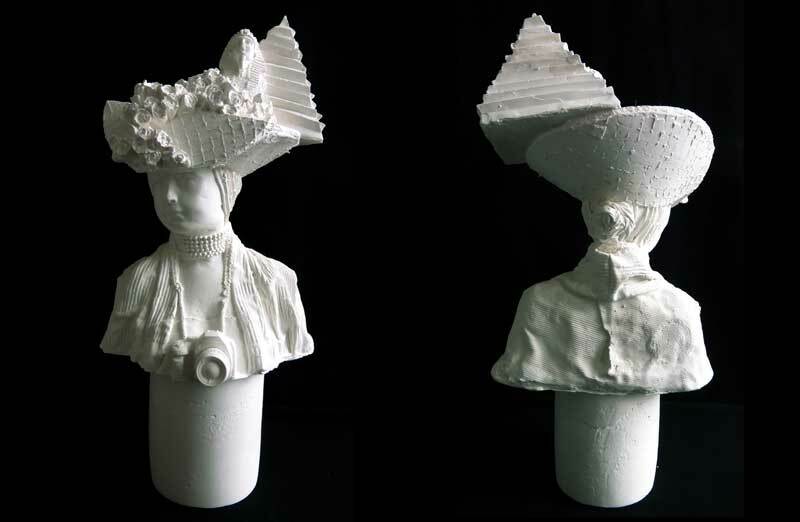 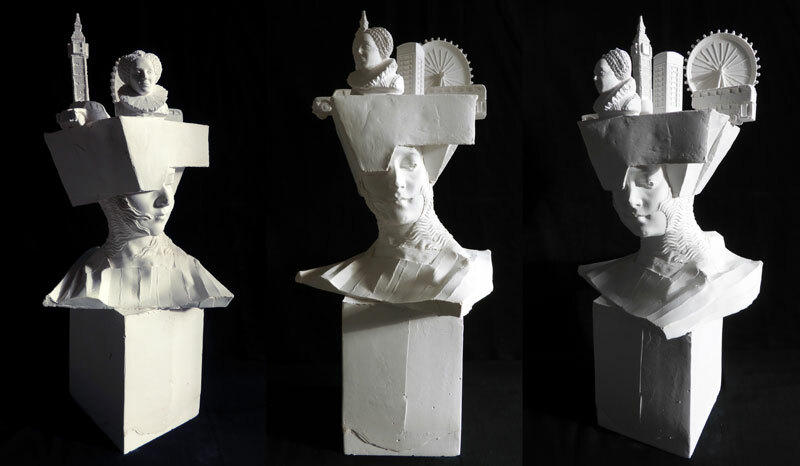 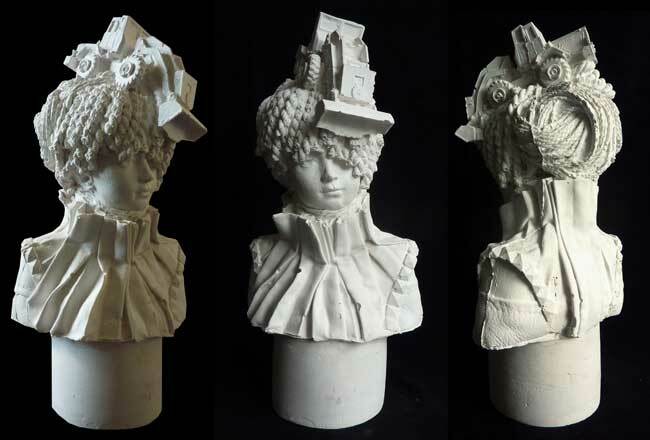 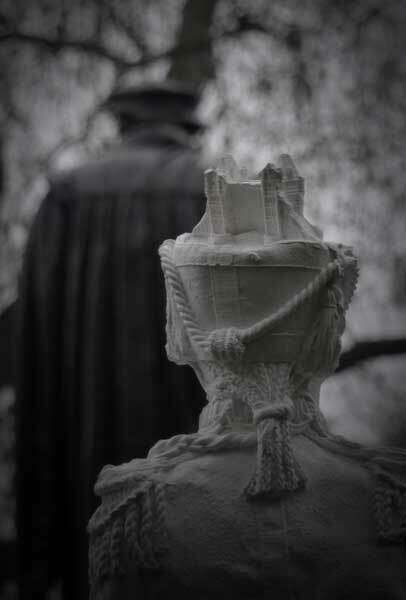 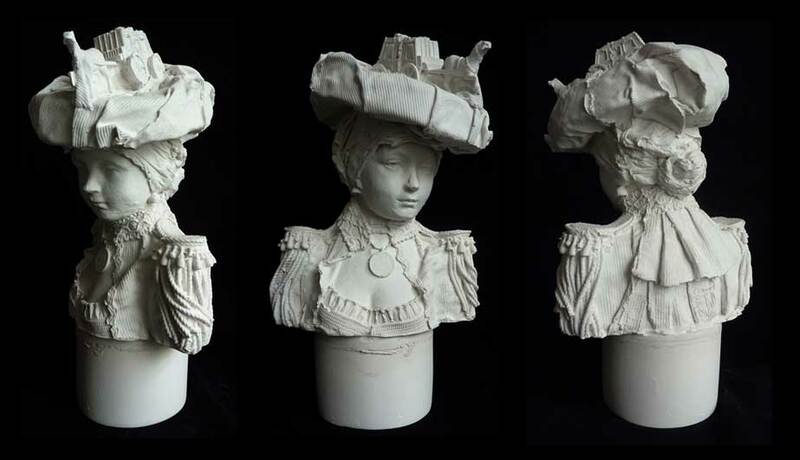 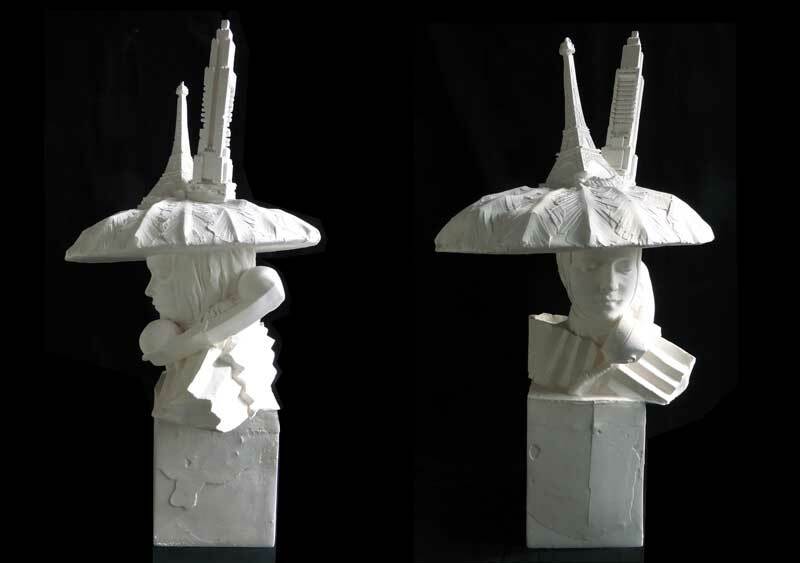 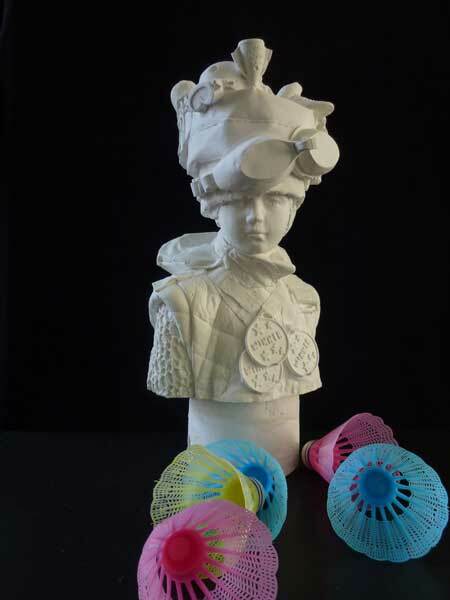 The idea of placing architectural monuments, iconic landmarks and random objects on the headdresses was inspired by the intriguing 18th century fad of decorating hats with very large scale, incongruous objects - famously Marie Antoinette adorned a hat with a huge ship in full sail. 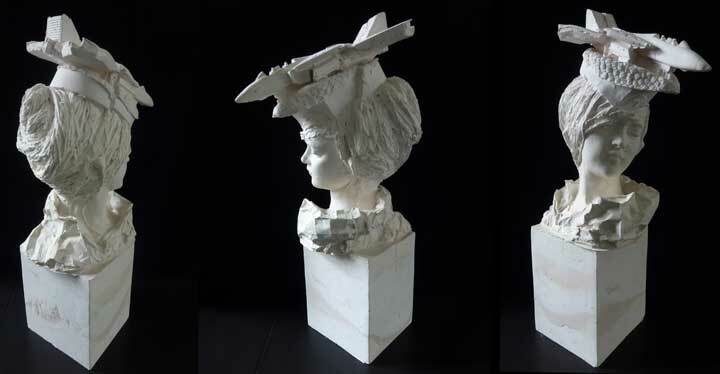 Paperback Writer ht: 61cms / 24"
Artist ht: 59cms / 23"
Cosmopolitan ht: 70cms / 27.5"
Blade Runner height: 35cms / 13.5"
Space Cadet height: 37cms / 14.5"
Explorer ht: cms 40cms / 16 "
Lafayette height 44cms / 17"
Etoile height 33cms / 13"
Zoro height 33cms / 13"
Lone Ranger height 33cms / 13"
Bricklayer height 37cms / 14.5"
Mme Maigret height 30cms / 12"
Josephine height 34cms / 13.5"
Galileo height 35cms / 14"
Miss London Town height 32cms / 11"
Miss Get-set-go height 34cms / 13"
Maestro height 25cms / 10"
Gold Digger height 32cms / 13"
Demoiselle D height 28cms / 11"
Highwayman's Girl height 28cms / 11"
Aviatrix height 29cms / 11.5"
Mamselle Chateau height 29cms / 11.5"
Tower Bridge Dragoon height 37cms / 14.5"
Ms Shakespeare height 26cms / 12"
La Cavaliere height 32cms / 13"
Madame Sacre Coeur height 35cms / 14"
Madame Fruits height 22cms / 8.5"
Miss Grape height 27cms / 13.5"